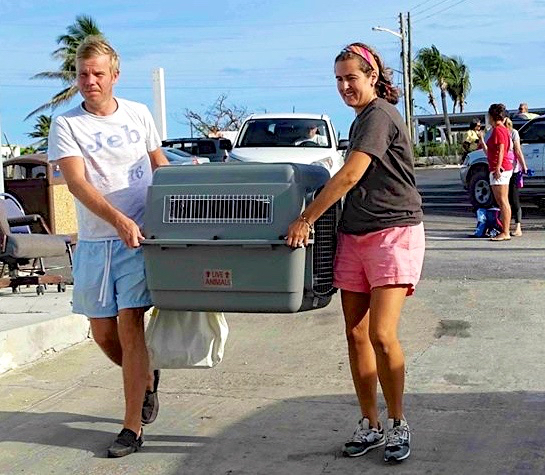 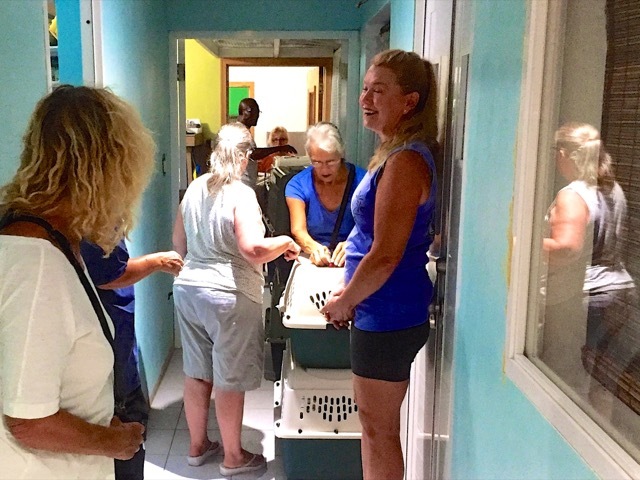 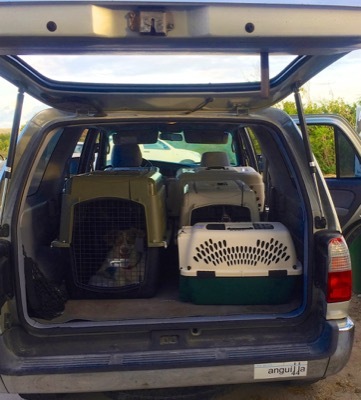 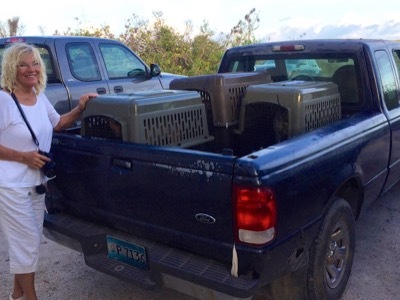 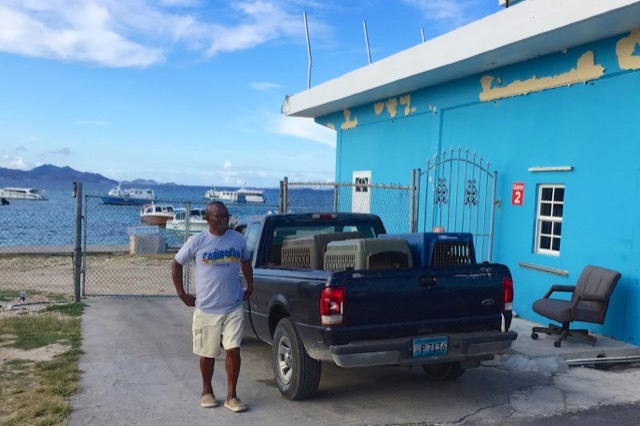 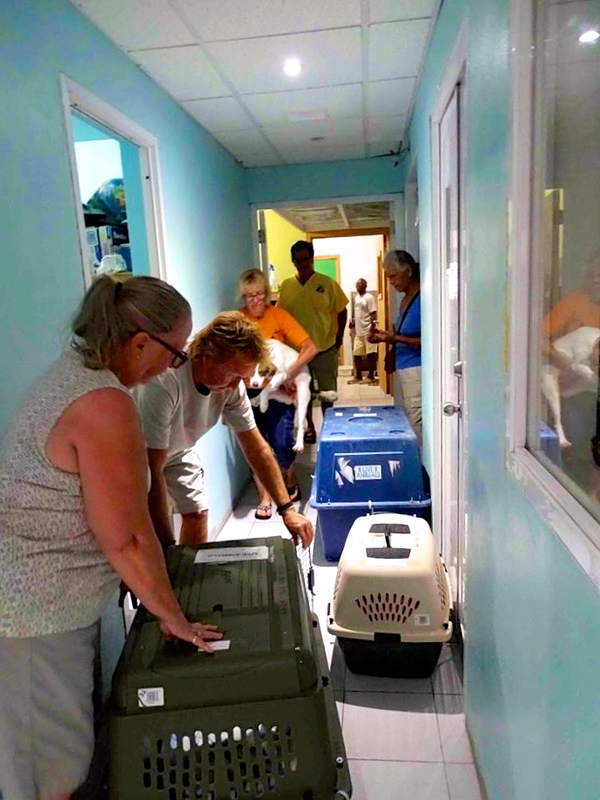 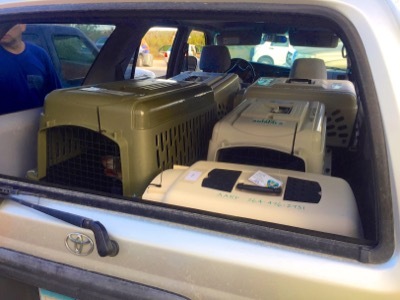 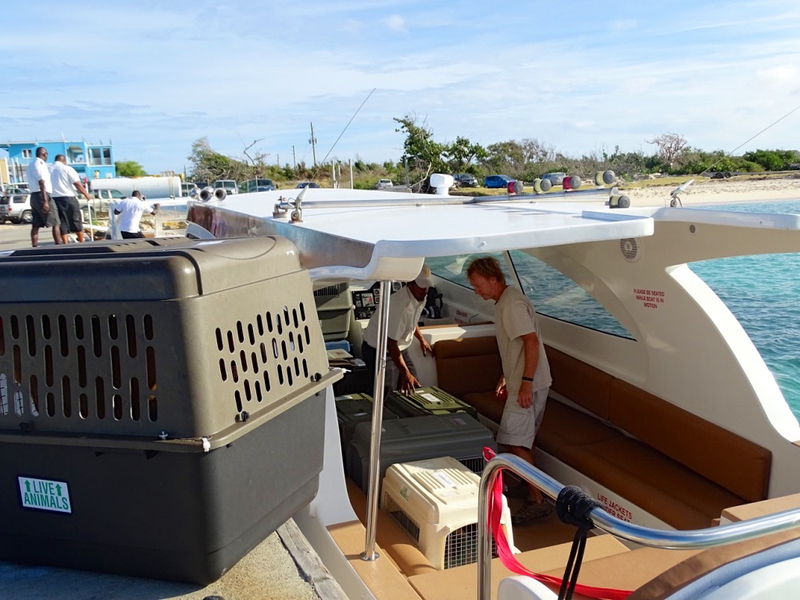 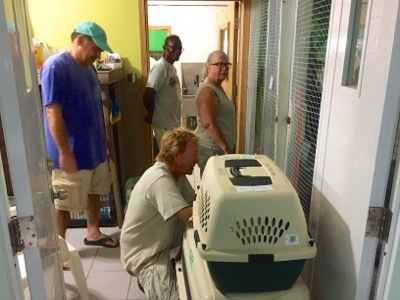 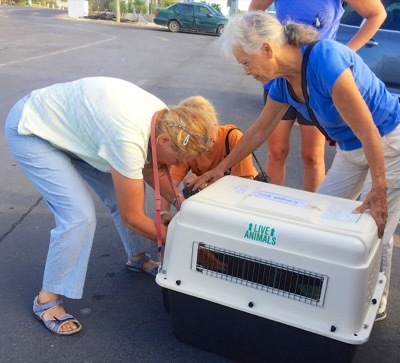 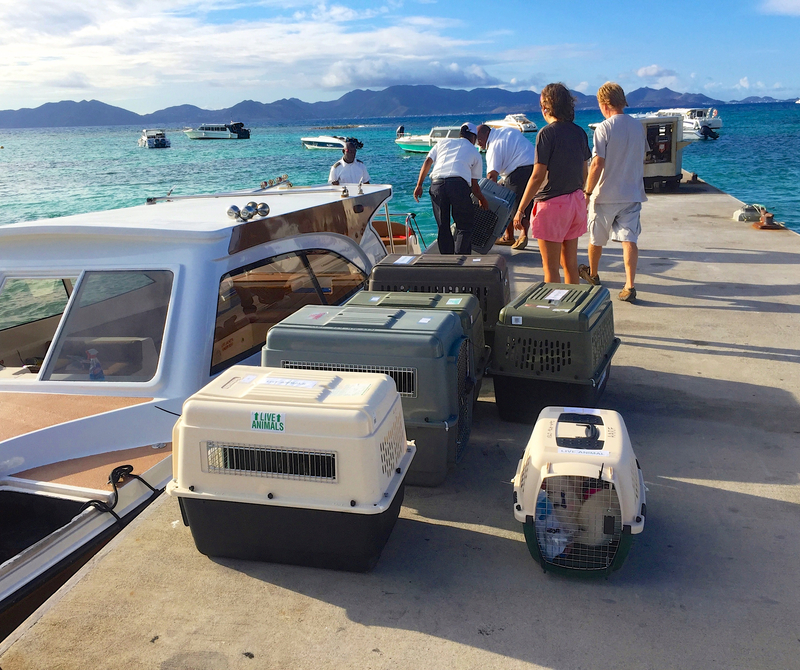 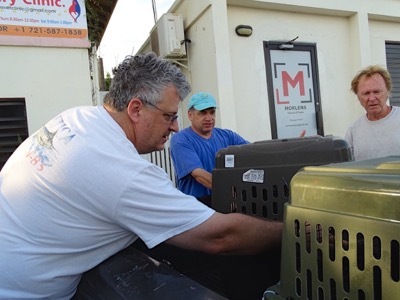 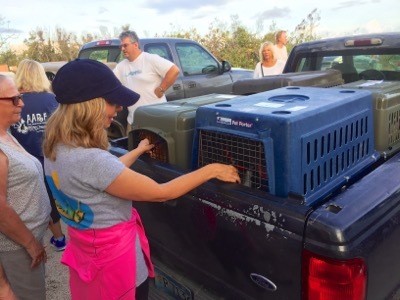 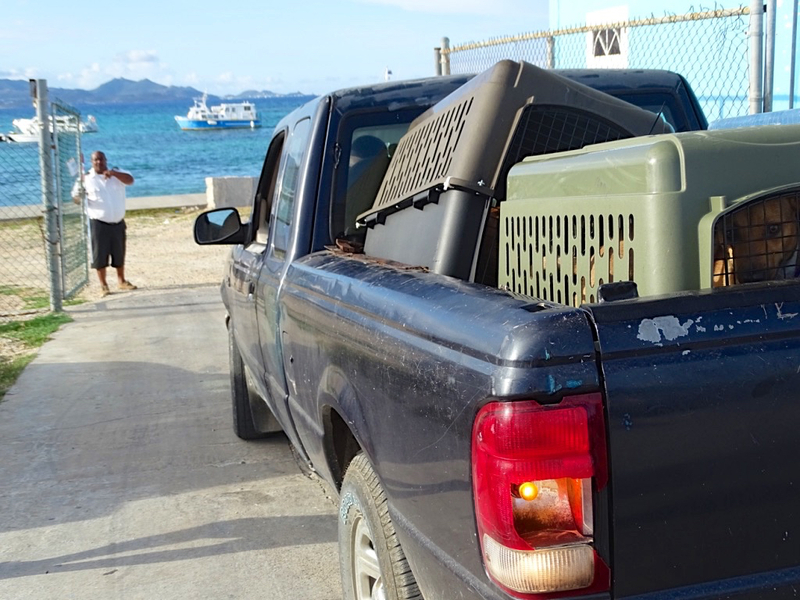 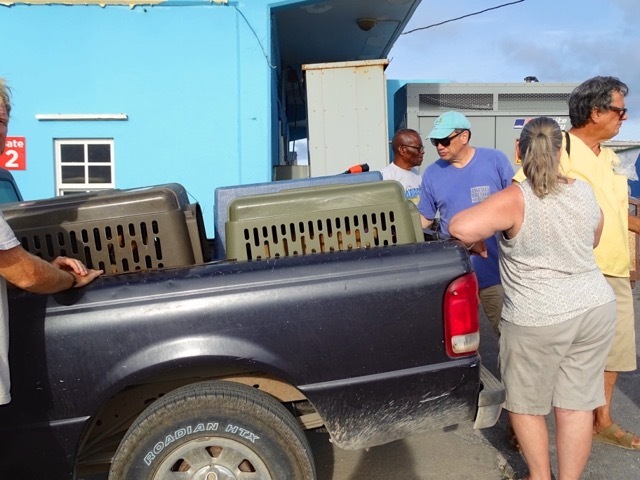 On April 3rd 2018, Anguilla Animal Rescue Foundation volunteers assembled at the AARF Shelter and Morlens Veterinary Clinic to gather, prepare and load 17 dogs and 3 cats to travel to the USA to be adopted. After many starts, stops, and changes of plans, this massive transport trip was finally a go! 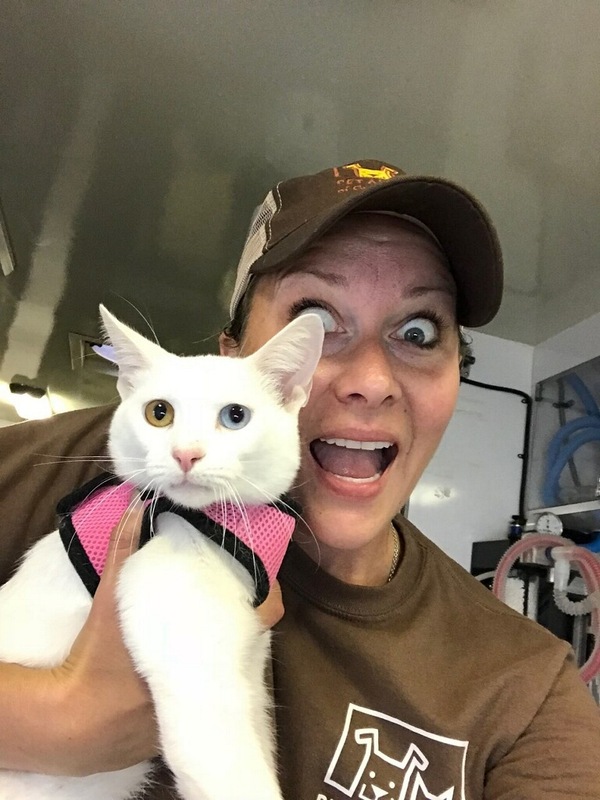 Why did we need to do this? The answer is that so many dogs and cats, victims of Hurricanes Irma (and Maria) in September, had been homeless. Some were surrendered to AARF, some wandered into people’s yards hoping for food and care and some were found living on their own. 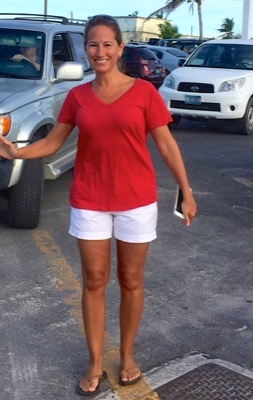 They were unwanted, with no one in Anguilla wanting to adopt them. They were all nice dogs and cats, some shy, some easy going, some frightened of people at first, all deserving of the love of a family that wanted them. 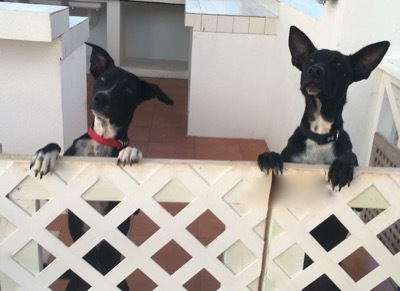 Then, in December, we started seeing more surrenders of adult dogs. 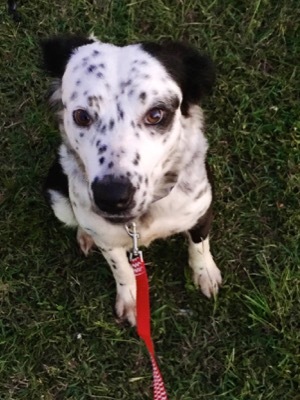 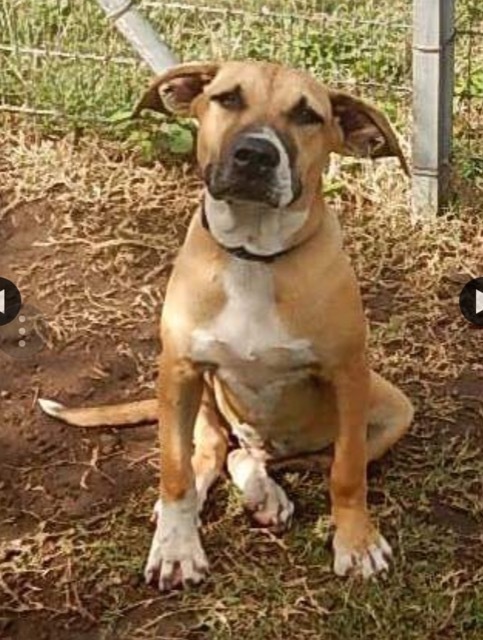 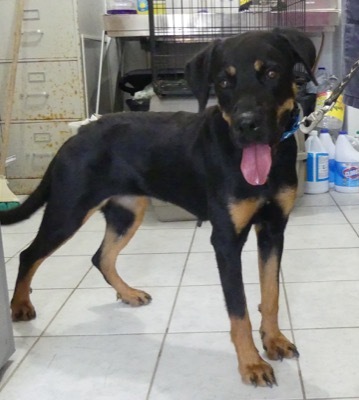 We heard of dogs abandoned on beaches, in the bush, and showing up in people’s yards. 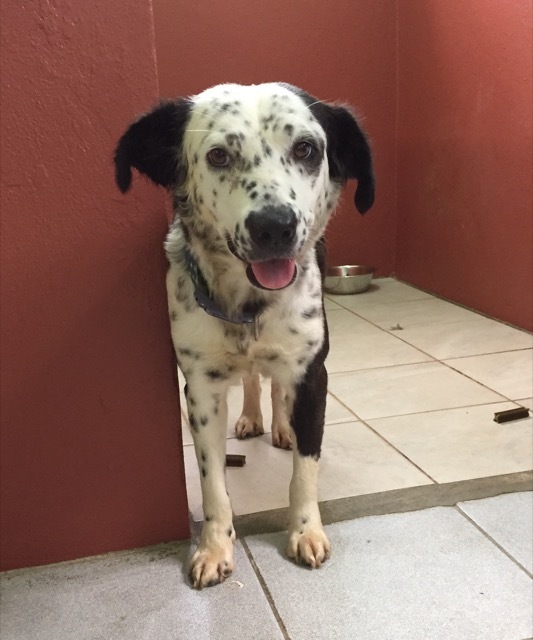 There were no adoptive homes in Anguilla for these dogs. 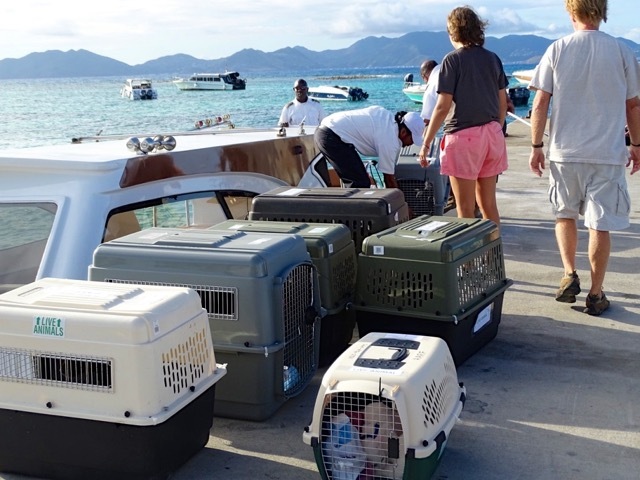 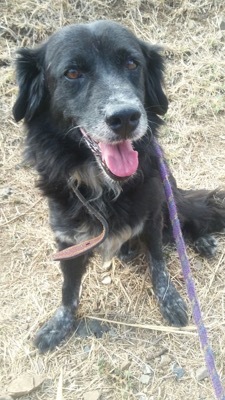 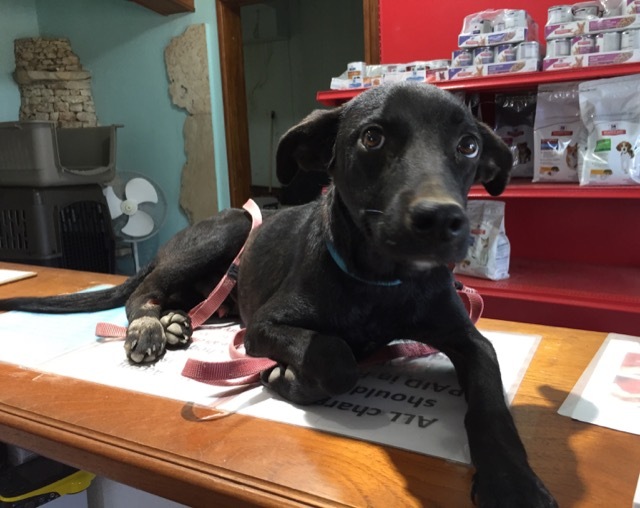 We had offers from rescue friends in the States to help — but getting them there was going to require expensive chartered flights, and we would only be able to help a few dogs. 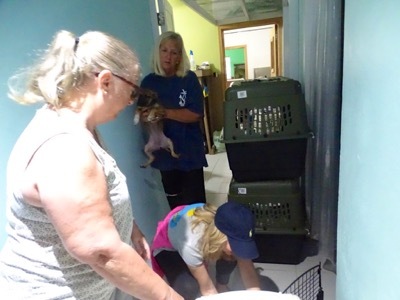 Meanwhile, the number of dogs and older puppies who needed our help continued to rise. 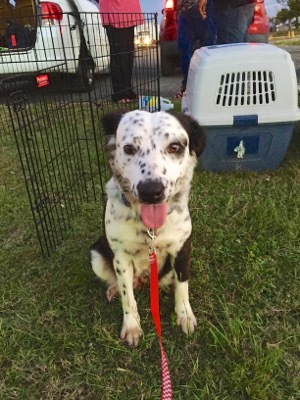 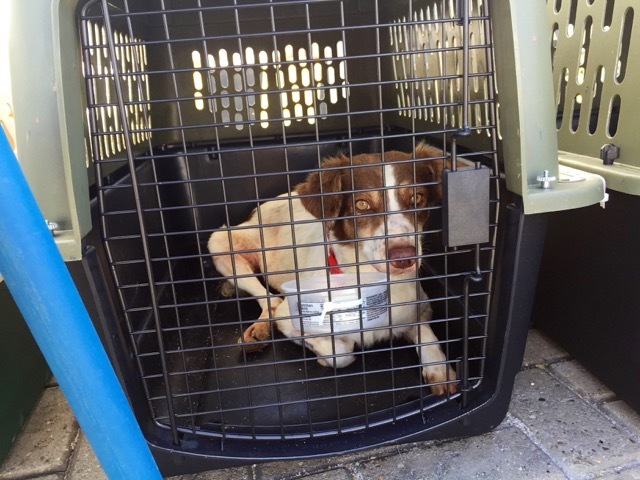 At the end of January, we reached out to Captain Sali Gear of Island Dog Rescue from Virginia Beach, Virginia. 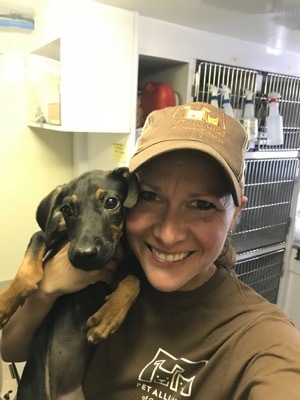 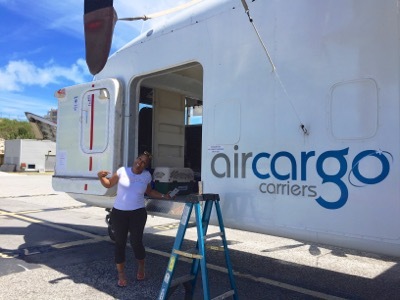 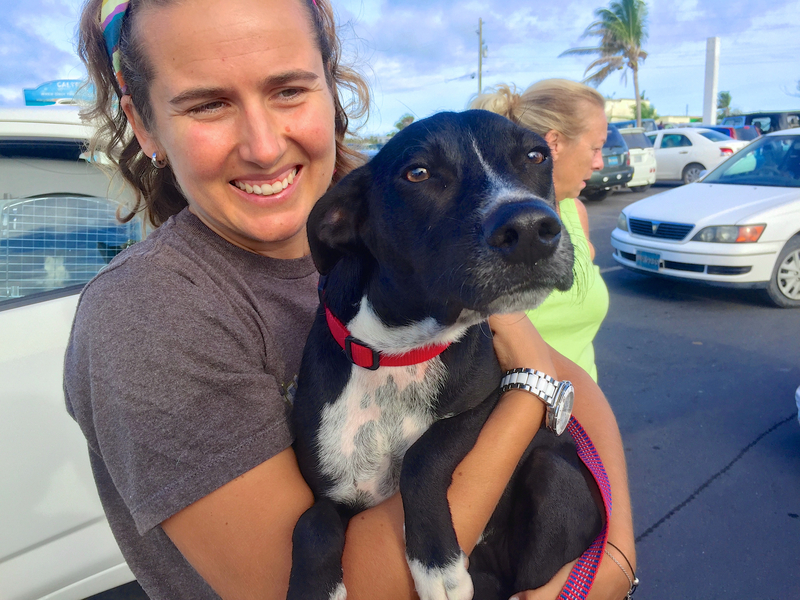 Sali, an airline pilot and Navy aviator, grew up in St. Croix and has done a lot of rescue in the US Virgin Islands and Puerto Rico, including helping large numbers of dogs after Hurricanes Irma and Maria. 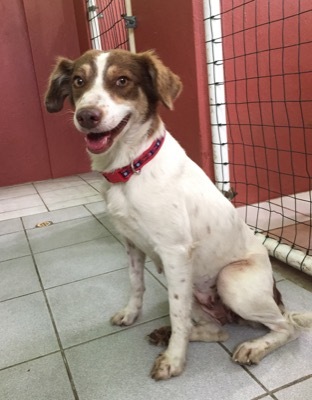 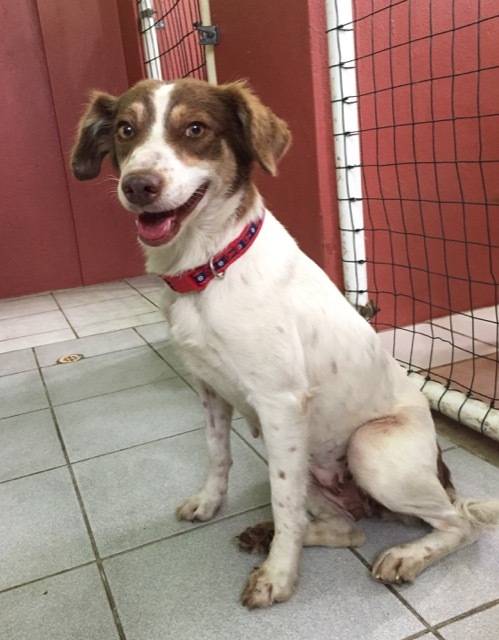 Sali said she would help us with transport and getting our dogs to rescue groups in the States once they arrived there, and we were elated! 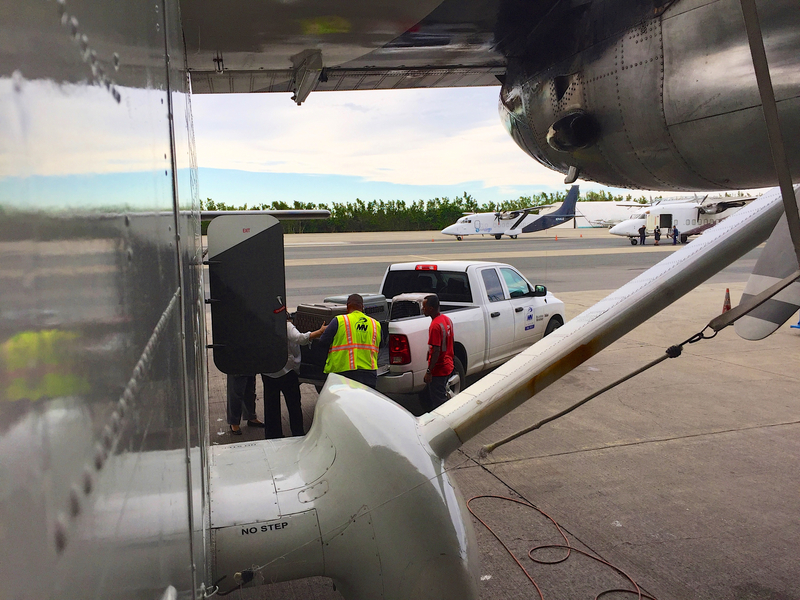 Over the next two months, we worked on the details, with a lot of ups and downs along the way, none of it easy. 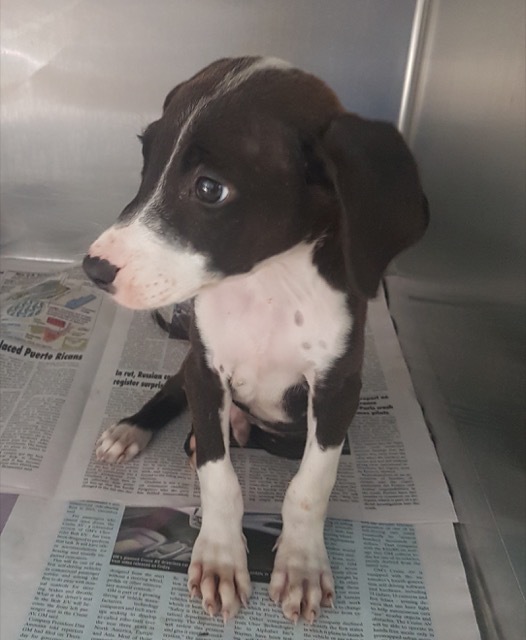 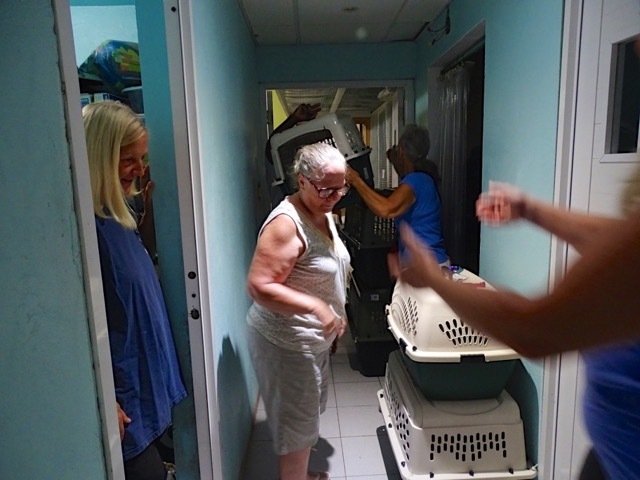 But we stayed focused on helping the growing number of dogs (and by then, three cats as well) who desperately needed our help to literally save their lives and bring them the happy forever homes that we all wanted for them. 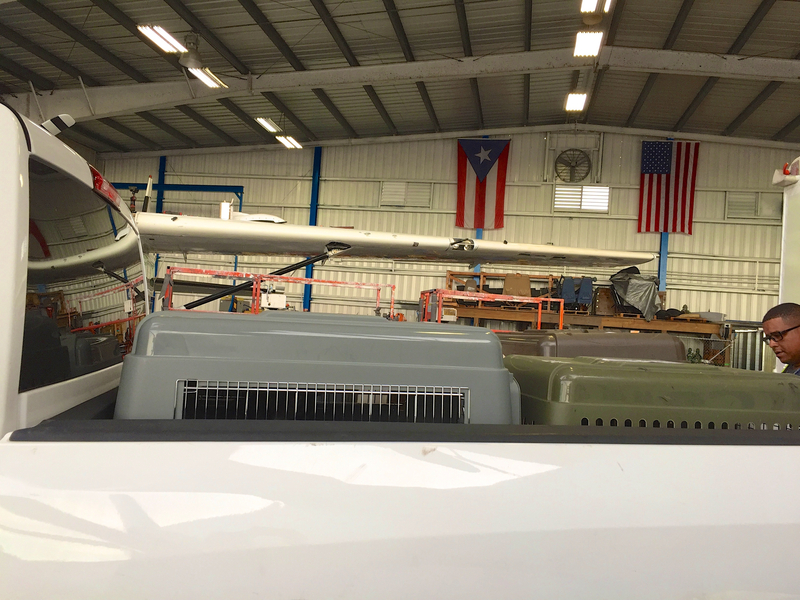 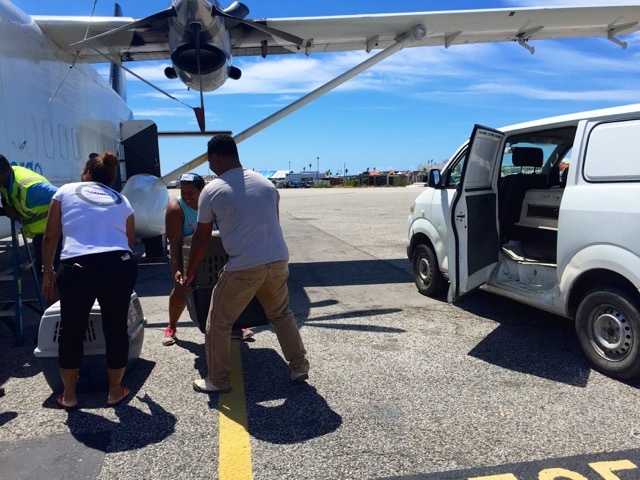 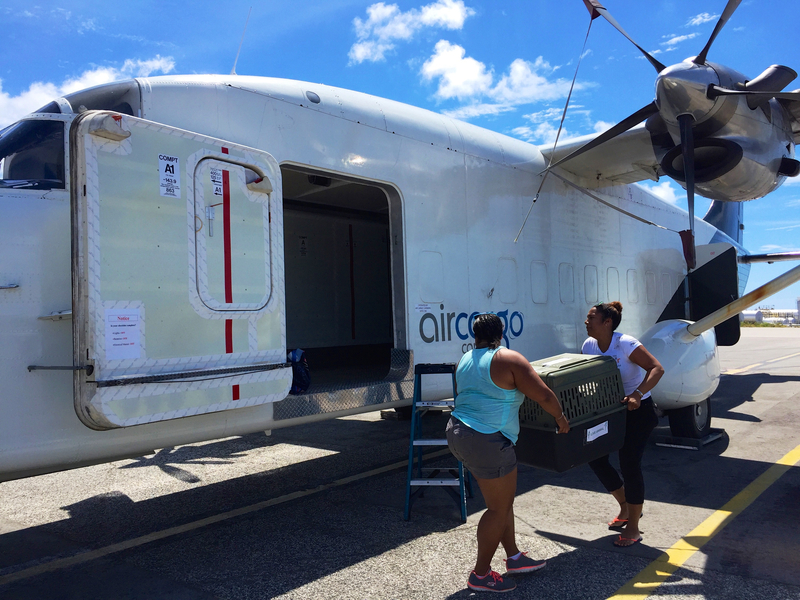 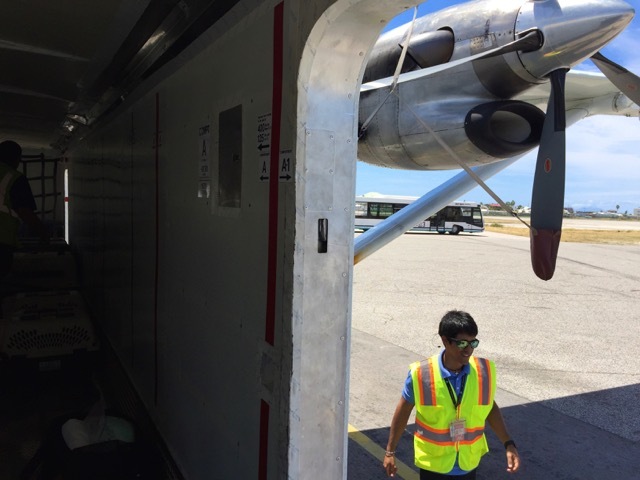 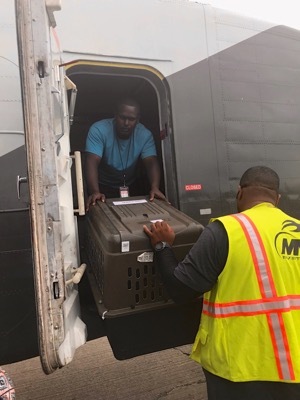 The final plan was to get the animals to Sint Maarten, where a chartered cargo plane (M&N Air Cargo) would take them to San Juan. After that, they would be transferred and flown to Miami. 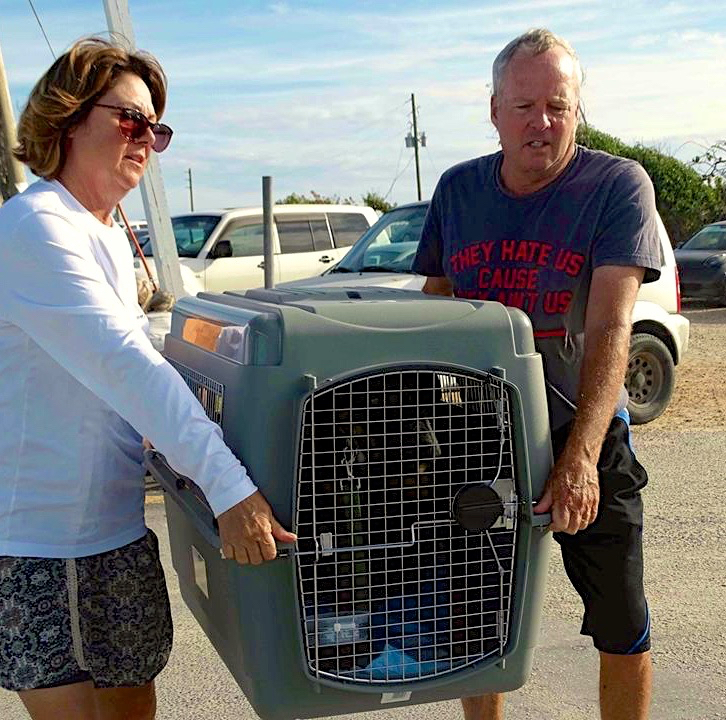 Each step in the process had to be met on time or the chain would break and the mission, which had been in the planning stages for over two months, would fail. Prior to April 3rd, animals had to be selected, collected (some were in foster homes, some at the AARF shelter), testing done, vaccinations and medications had to be dispensed, paperwork had to be done, crates had to be acquired and built, everyone and everything had to be weighed for the aircraft weight and balance calculations, transport to Sint Maarten was needed, and of course many volunteers and vehicles were needed to load and get the animals on the road and into the air. 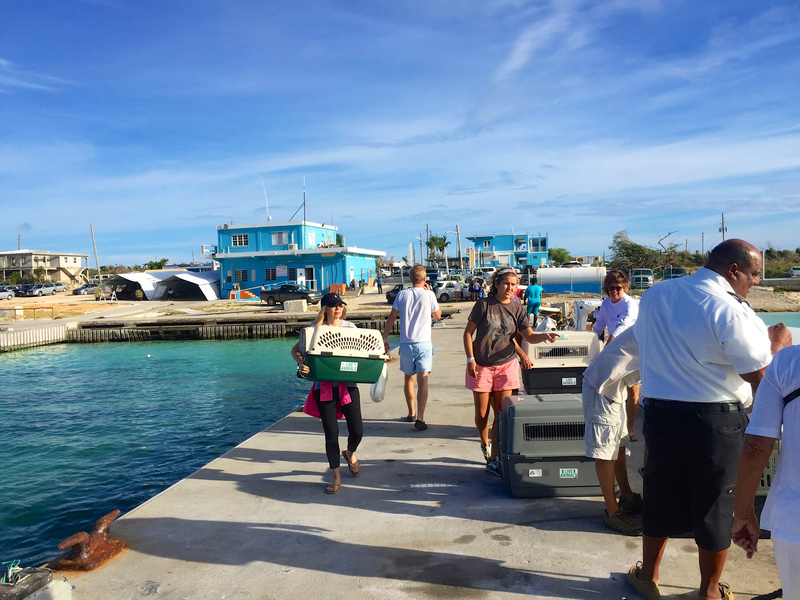 At 6:15am on the 3rd, the loading began. The animals were loaded into already–built crates labeled with names. There were eighteen crates for the 17 dogs and the 3 cats, with some kennels being shared, and Morlens halls and pet areas had crates everywhere! 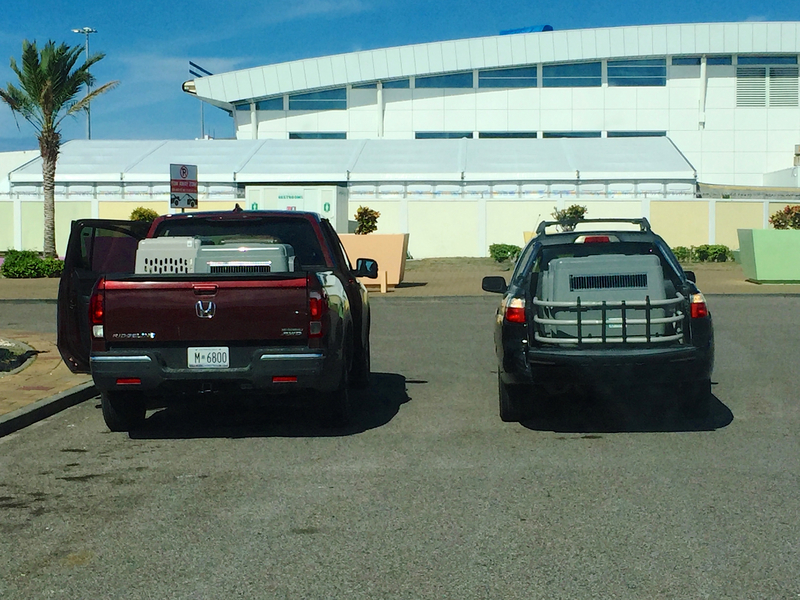 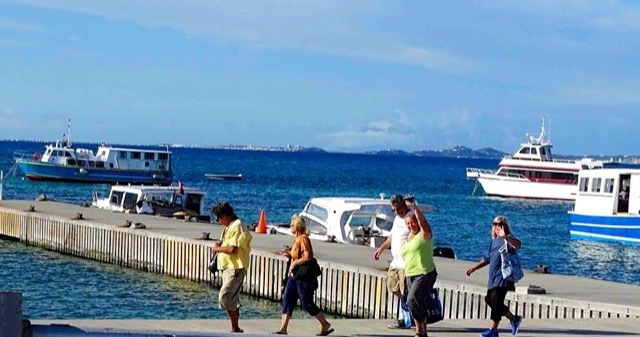 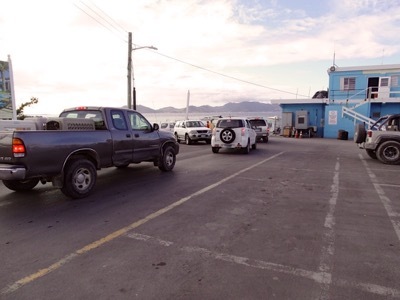 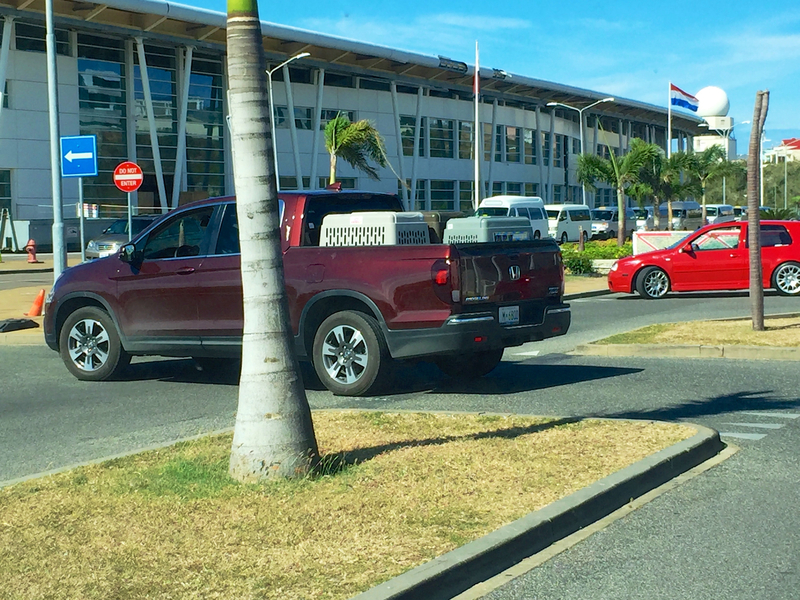 After loading up into three trucks and several cars, all were driven to Blowing Point to take the Calypso ferry to St. Maarten. 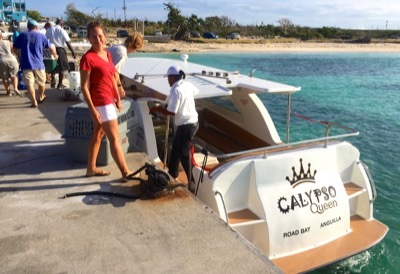 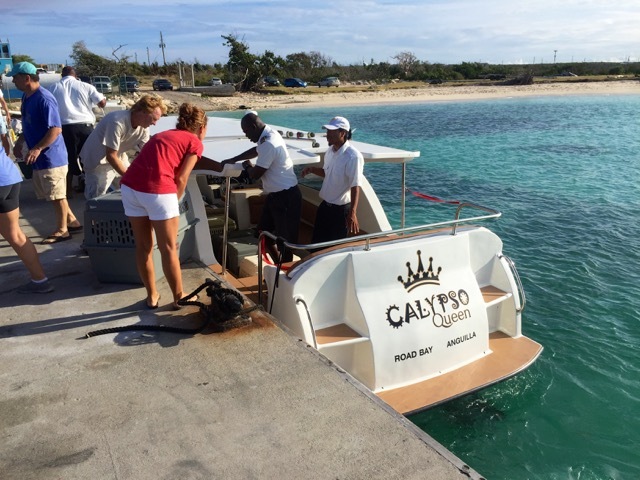 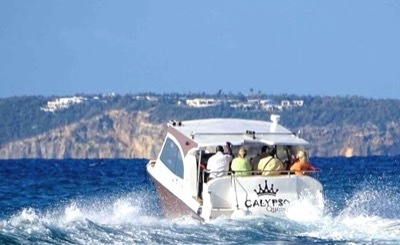 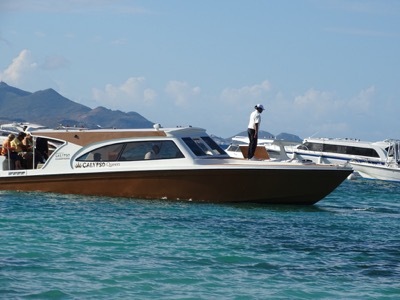 Next came a crucial step and our AARF–friendly ferry company, Calypso, delivered again. 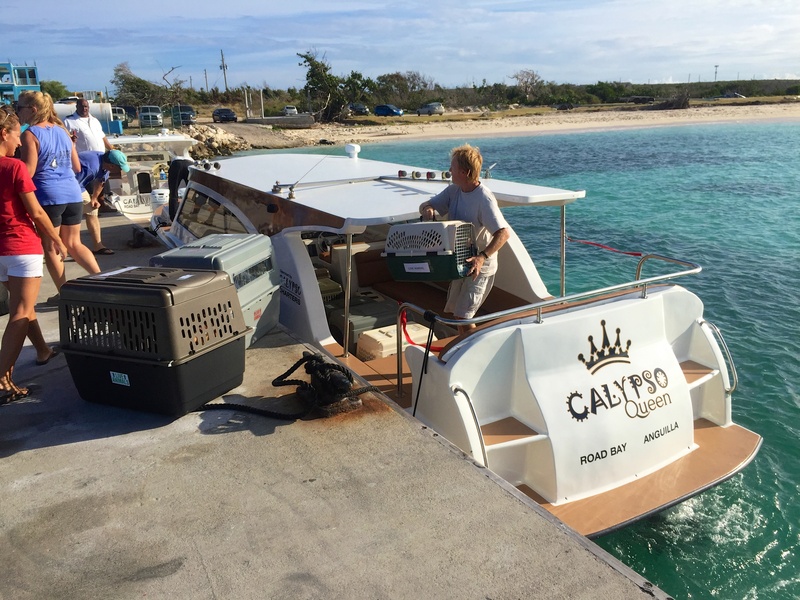 We needed a BIG boat for the massive amount of crates, and Calypso gave us what we needed, taking their largest boat out of service for us. 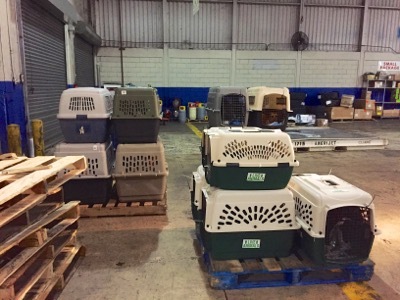 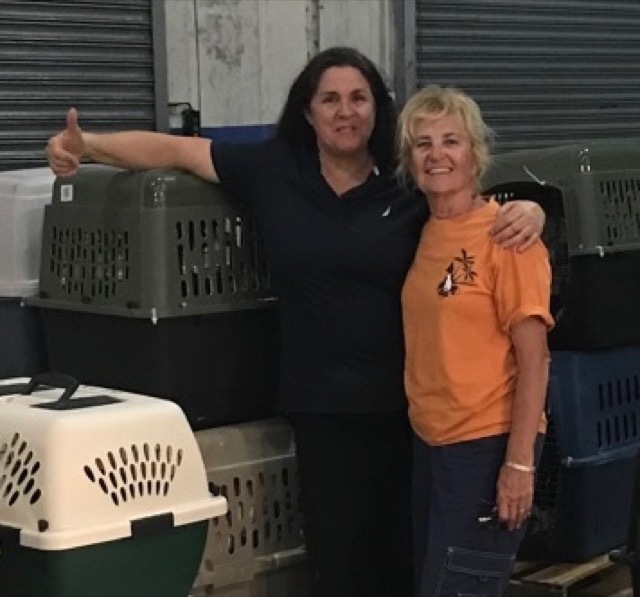 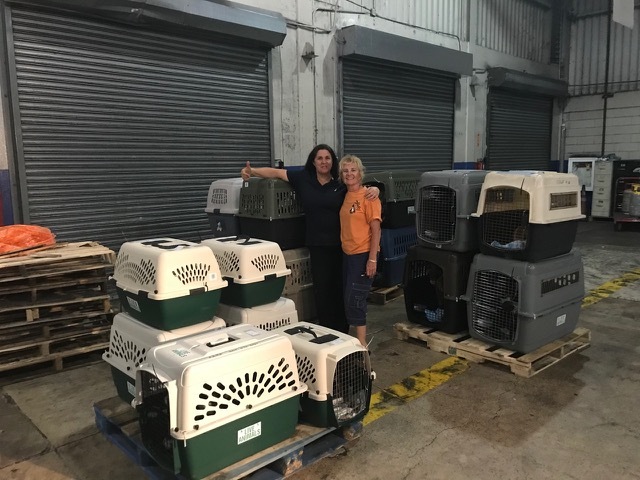 The Calypso team has, for years, been unbelievably supportive in helping AARF transport pets to the USA — but this was a massive undertaking. The entire Calypso team was cheerful and happy to make this happen, with Rosmund and Erica personally there to help see everyone off. 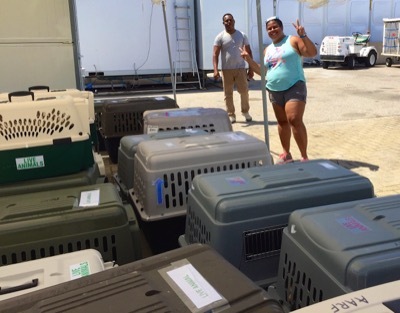 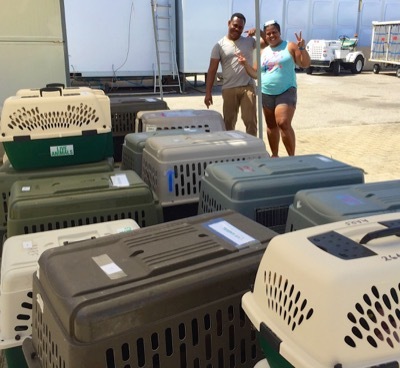 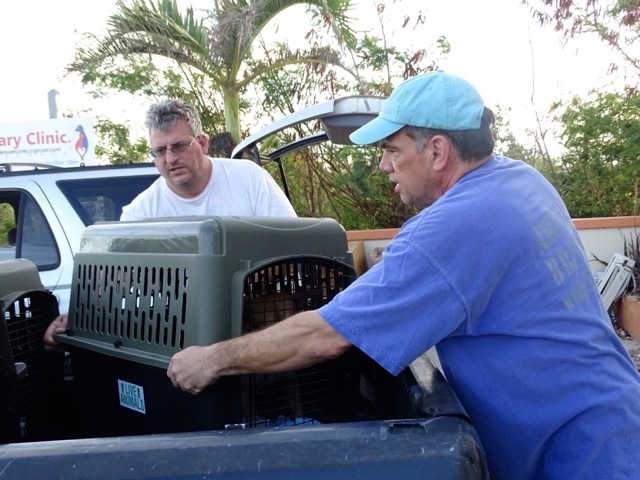 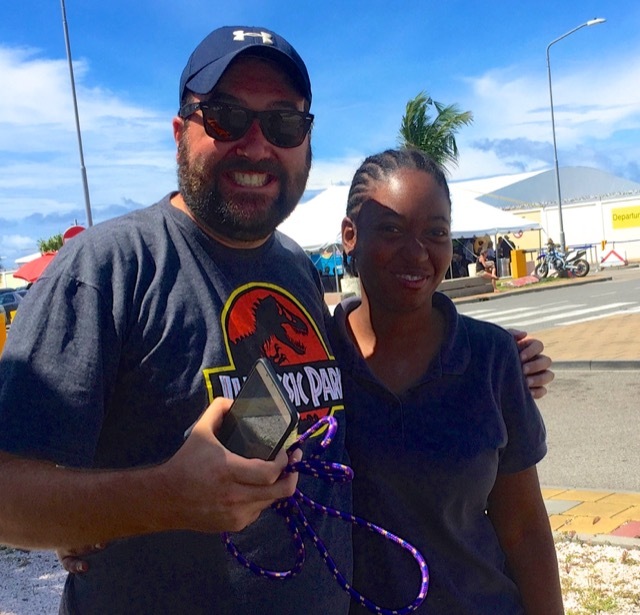 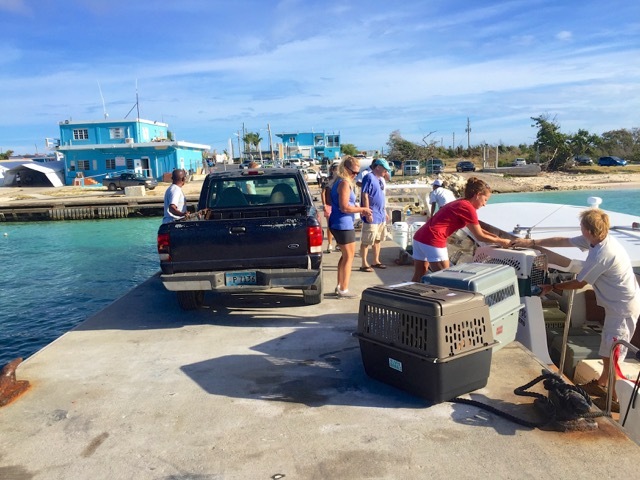 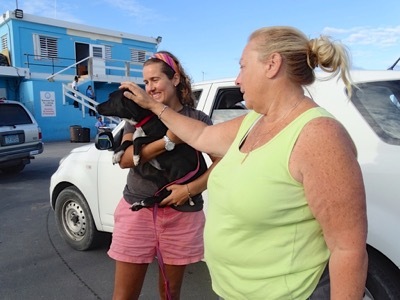 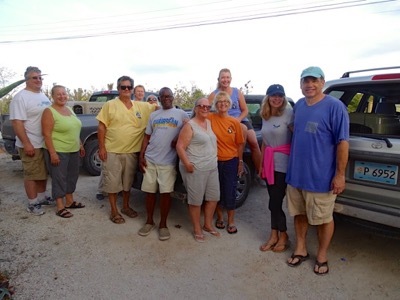 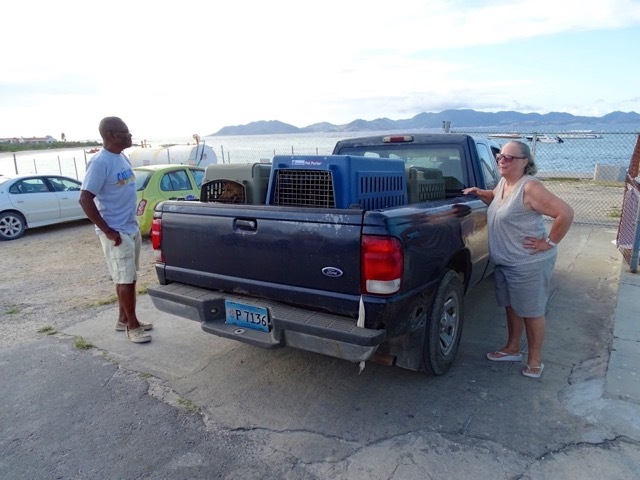 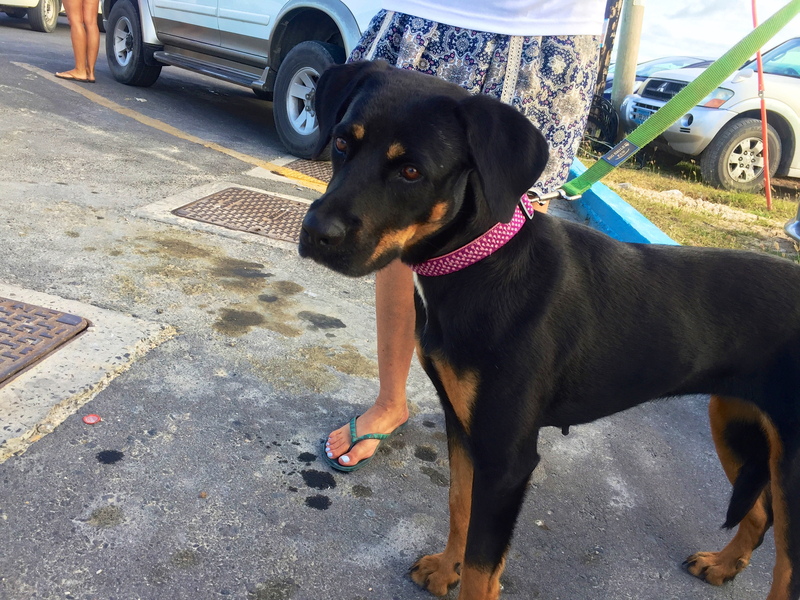 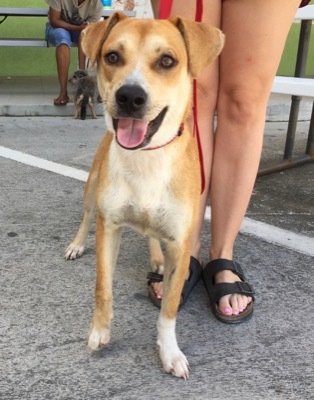 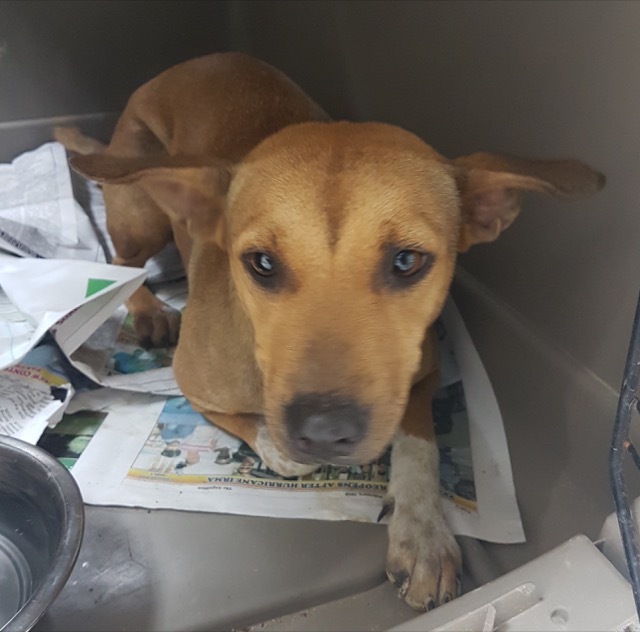 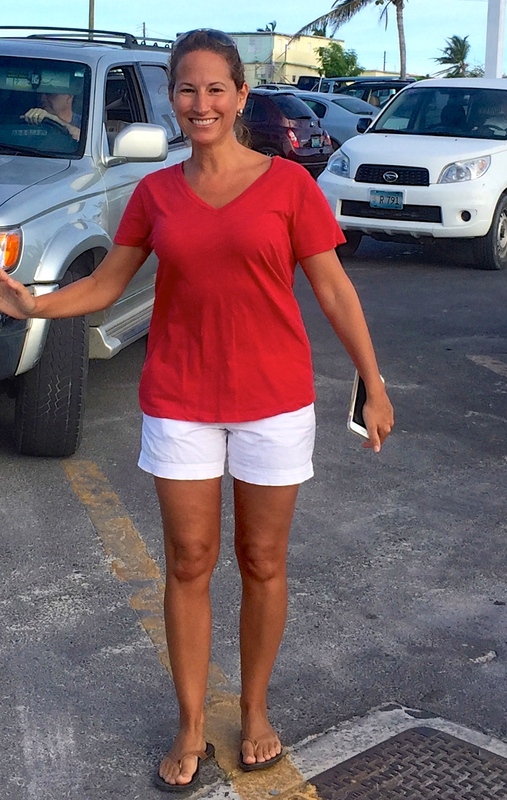 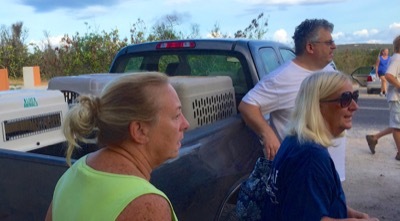 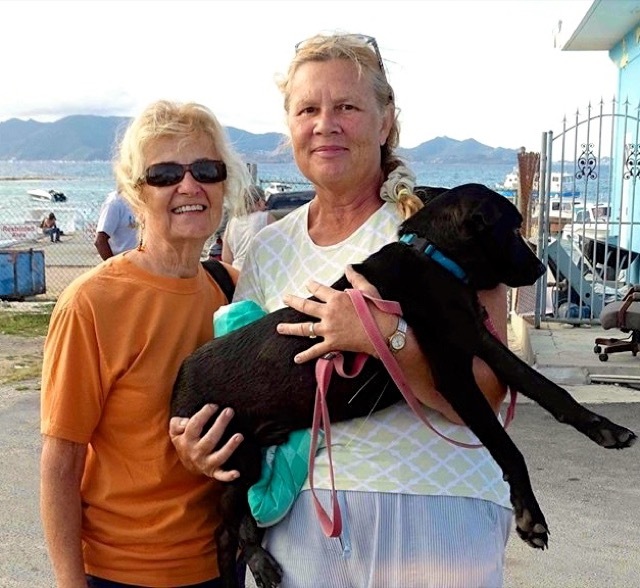 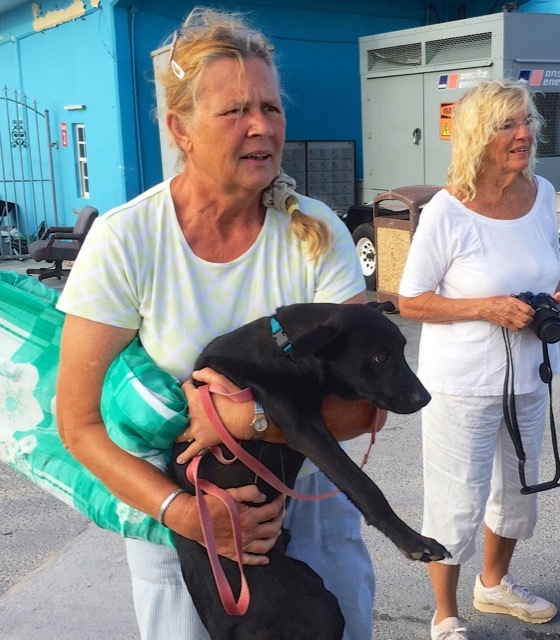 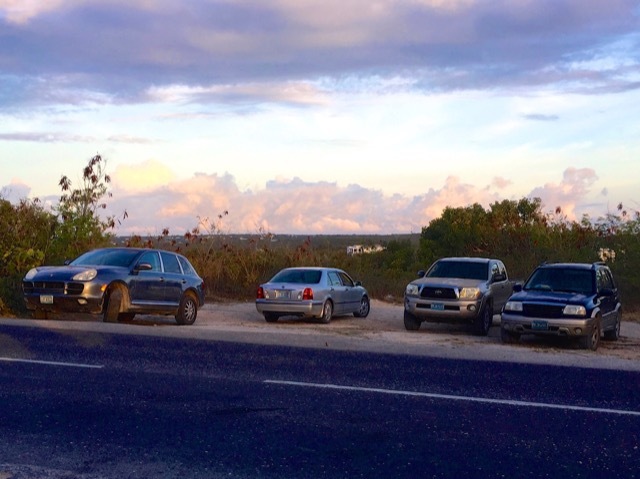 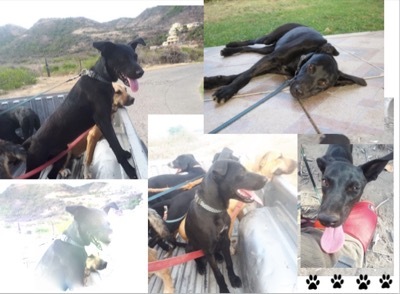 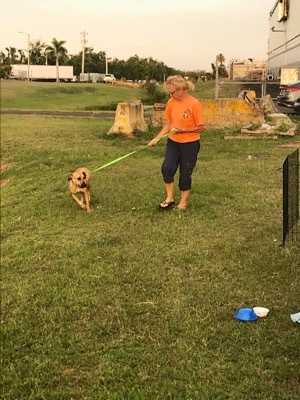 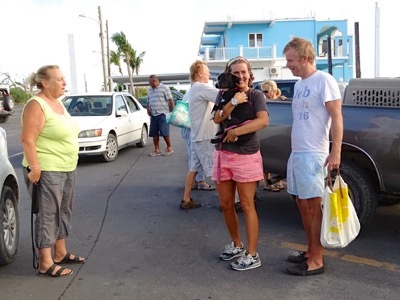 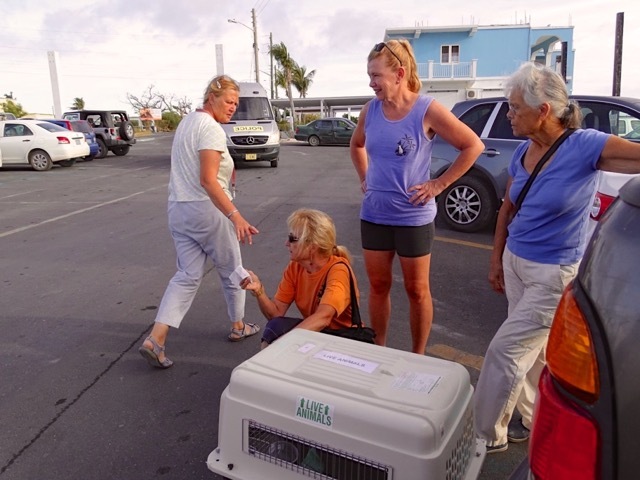 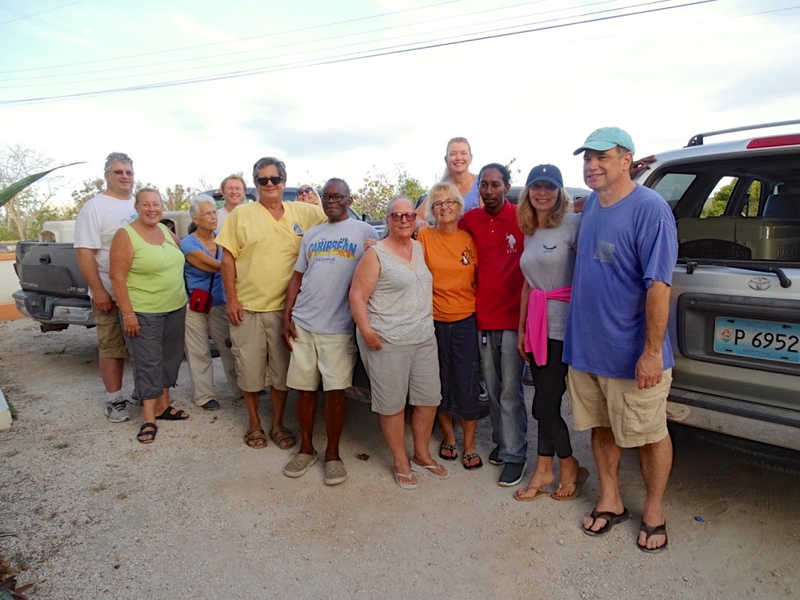 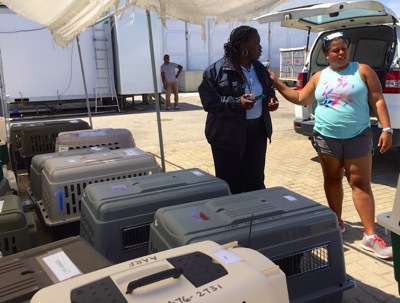 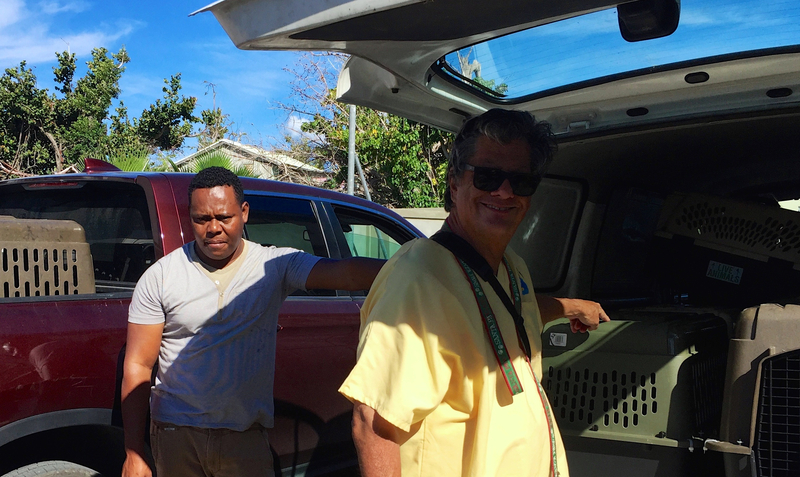 Five AARF volunteers (Sally, Renee, Mike, Suzie and Mark) accompanied the 18 kennels to Sint Maarten and met up with Dekha and her crew of friends, who also brought trucks and SUVs. 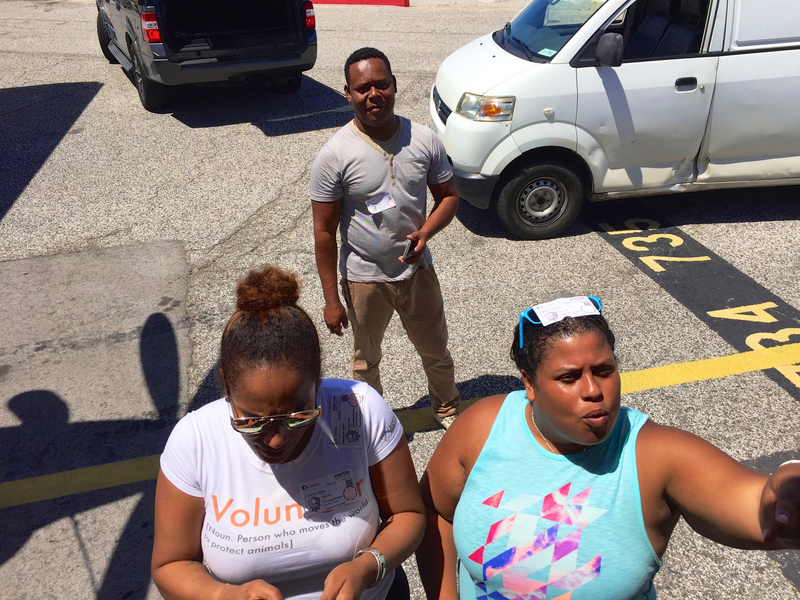 This was crucial step number three, and Dekha led the way to make it happen. 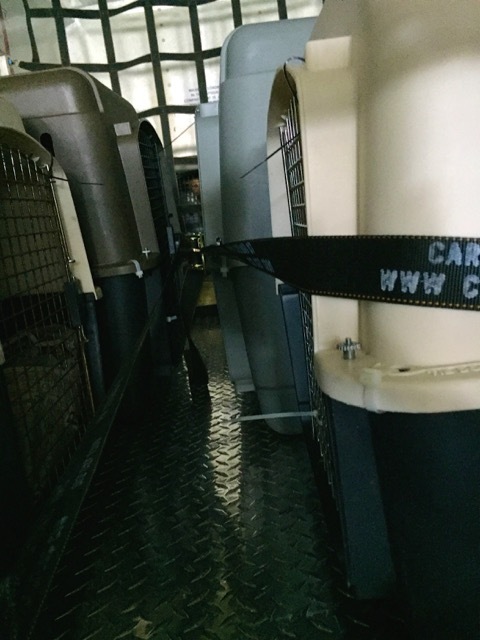 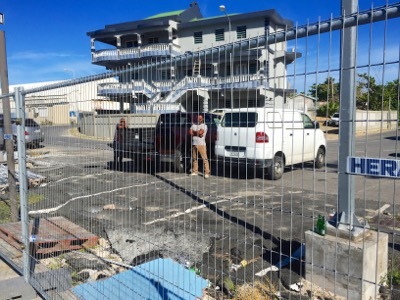 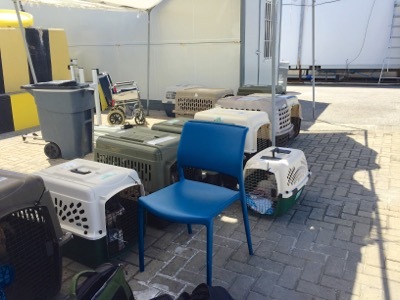 The kennels were offloaded from the Calypso at the Police/Immigration station and driven to Princess Juliana Airport (PJIA). 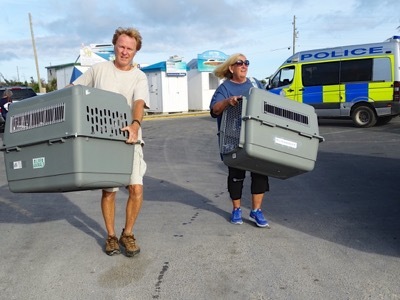 That required more than one trip back to the Police station, since there were so many crates. But they all eventually got to the airport. 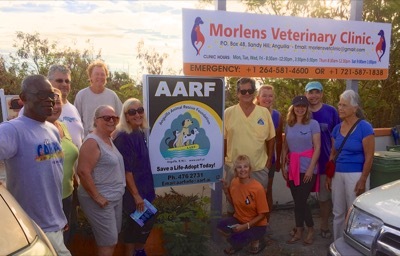 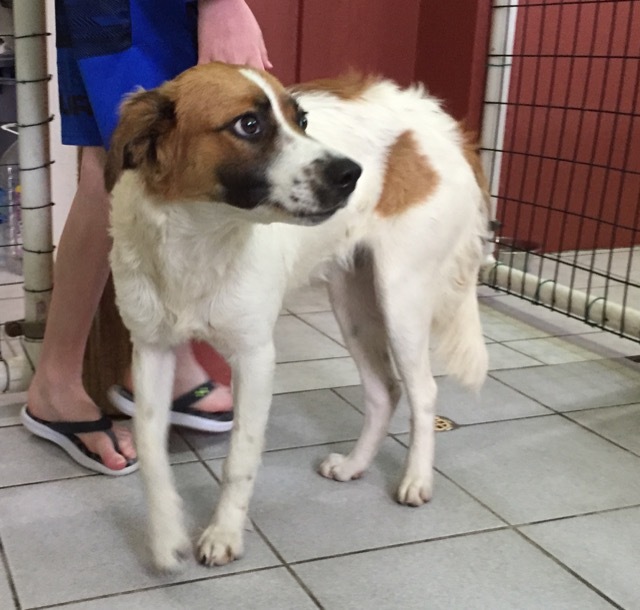 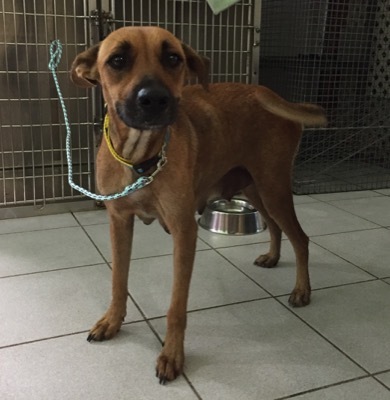 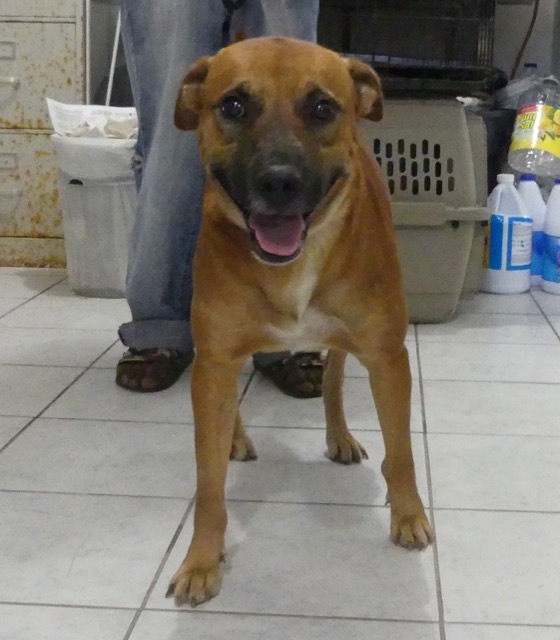 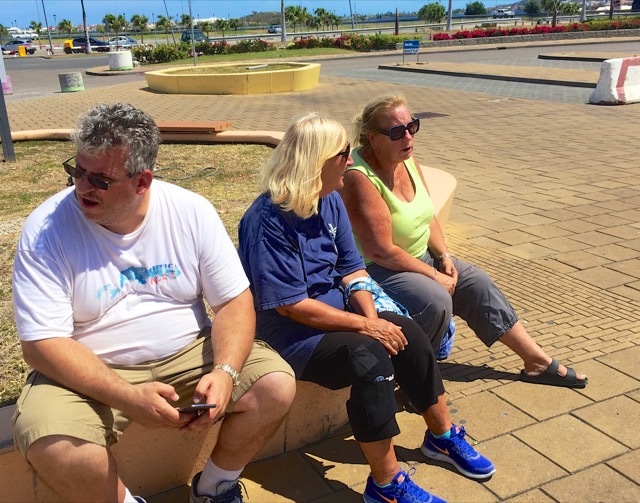 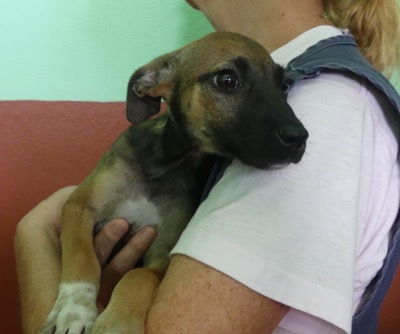 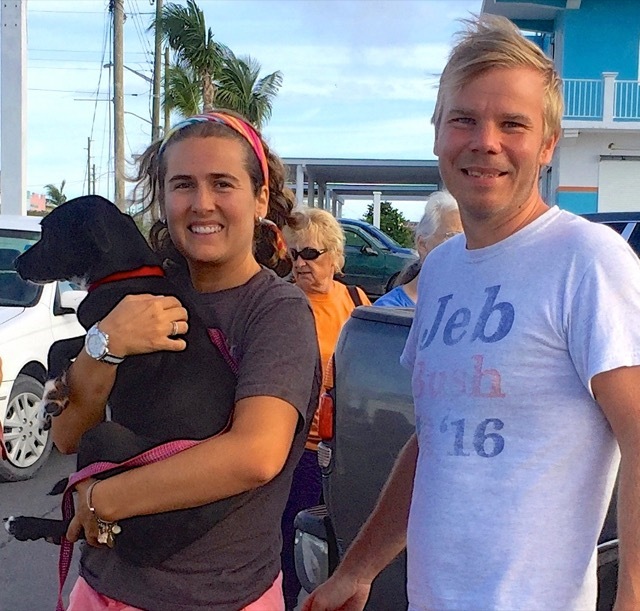 Three dogs joined the AARF ones: one from St. Maarten and two from Statia. About the airport: PJIA is still mostly destroyed, care of Hurricane Irma, but they’ve erected temporary tents and gates to handle the passenger, cargo and employee sides of operations. We needed to get into the temporary cargo area. But, first, there was a lot of cleaning to do! 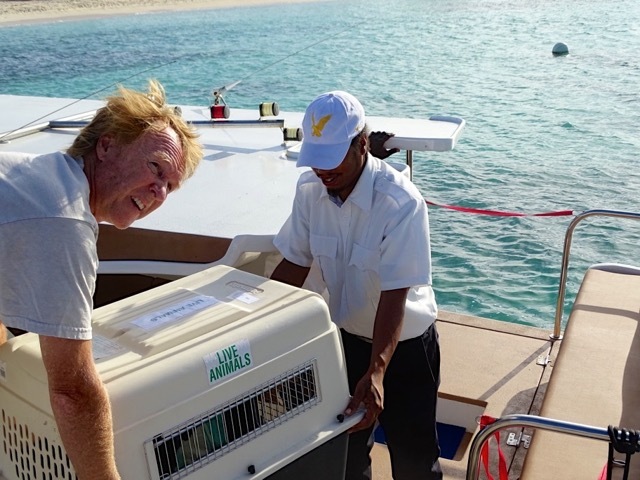 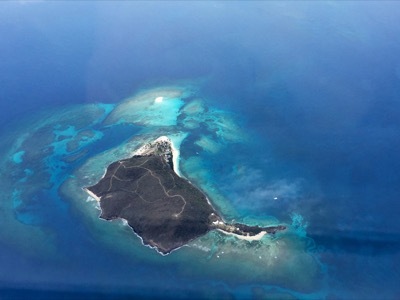 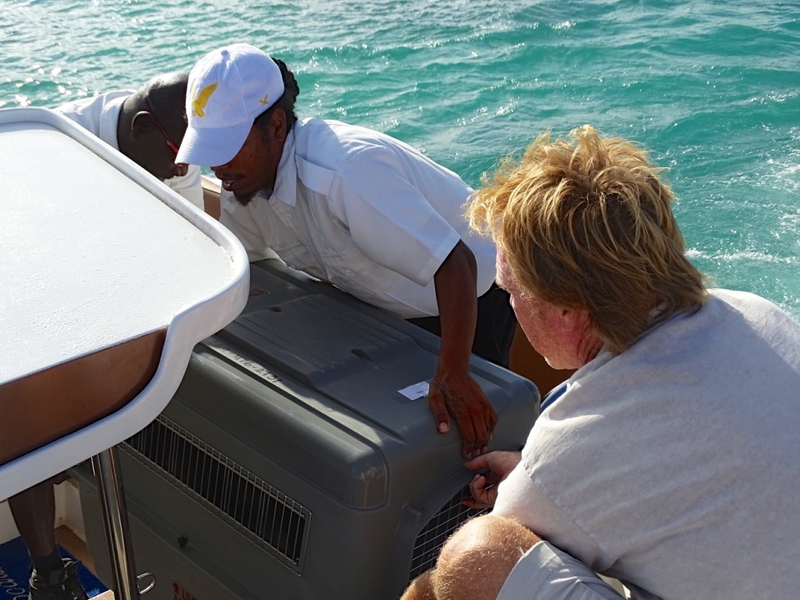 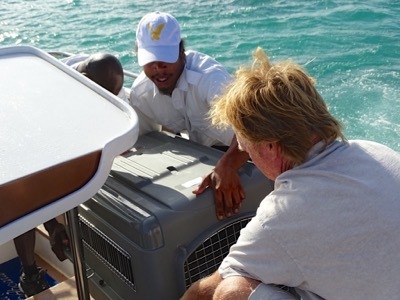 Unfortunately, many of the animals had either soiled their crates or thrown up during the journey over from Anguilla. 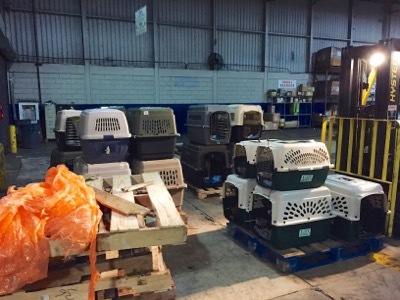 A really bad smell emanated from some of those crates. 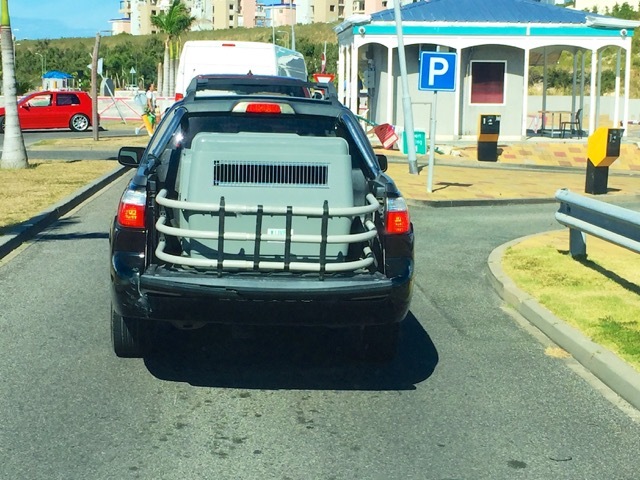 One of the vans holding a crate was impossible to drive without the windows down! 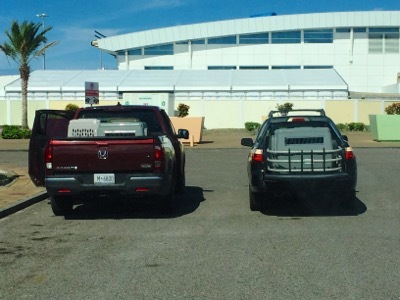 So a massive cleanup had to take place in the PJIA parking lot, prior to getting to the cargo area. But we had secret weapons in Renee and Mike. 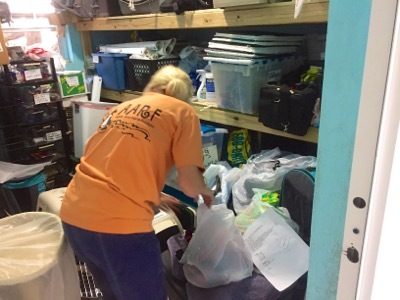 Renee was a trooper sticking herself all the way into the back of crates and cleaning. 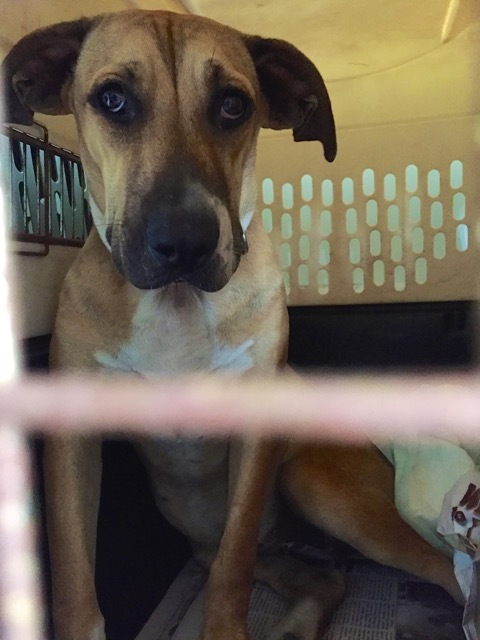 A bunch of baby wipes was used to clean poo-covered puppies. That was all she had. 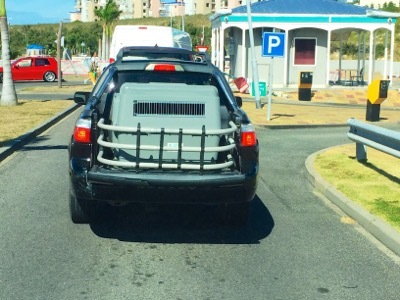 Running water? Nope. Next, the team was met by staff of Signature flight support. 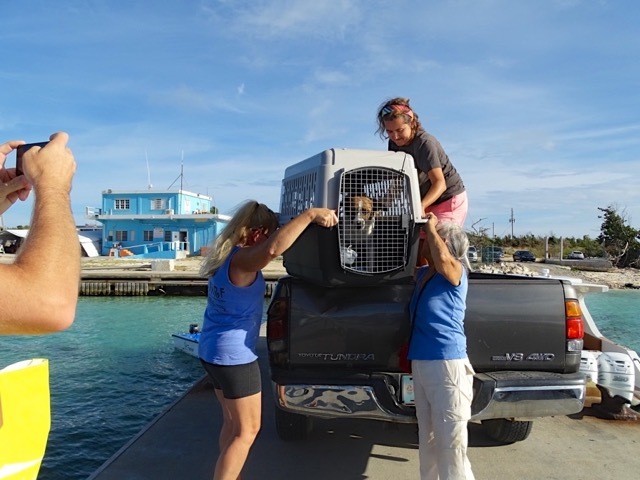 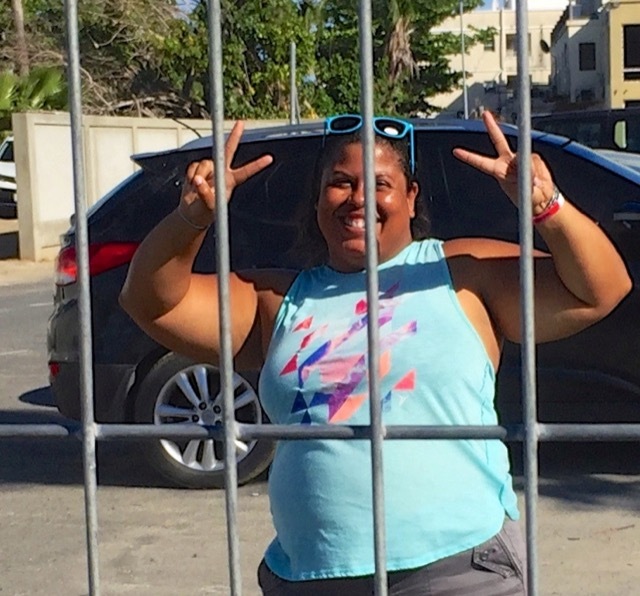 Dekha, Riselle (who volunteers at the SXM clinic and is a friend of Dekha’s), Dekha’s friend Vilra, who was driving/helping, and Sally got permission to go through the cargo and employee security gate while the others stayed with the animals. 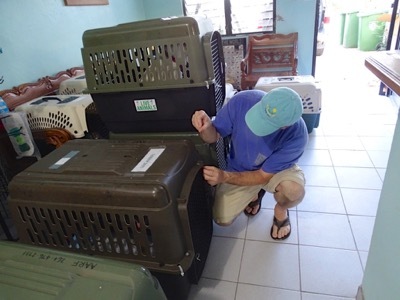 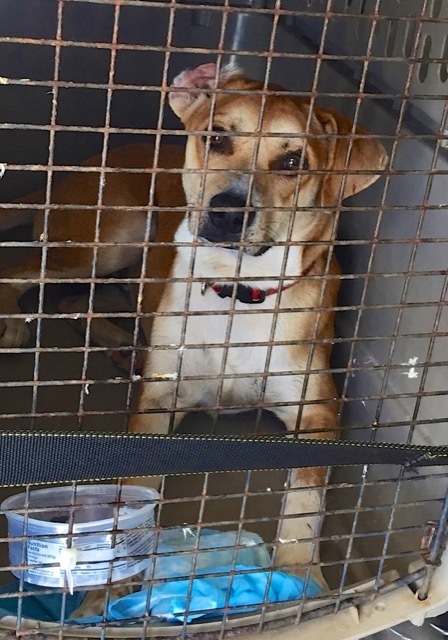 The crated animals were taken by the AARF volunteers who were outside to the cargo area security “cottage” where they were screened and sent through to the other side. That took some time, as can be imagined, since the crates had to be individually unlocked (reusable tie wraps made this easy). 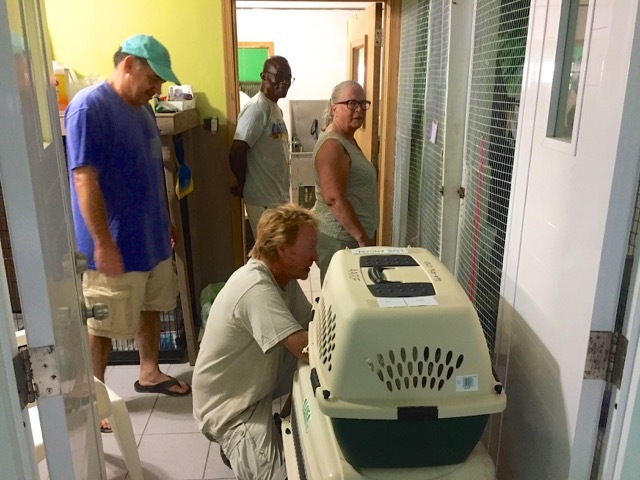 Plus, airport staff needed to go through the same checkpoint, so AARF had to step aside with a crate for each employee to get by. 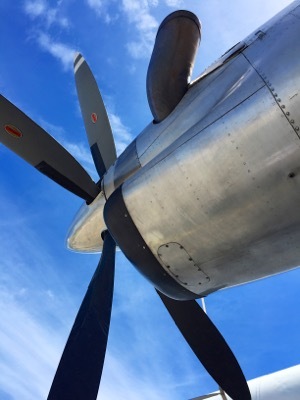 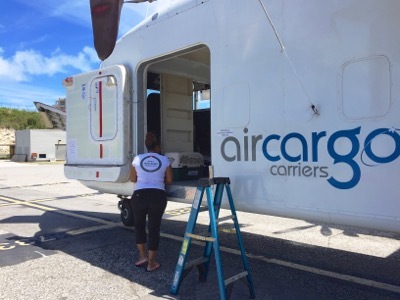 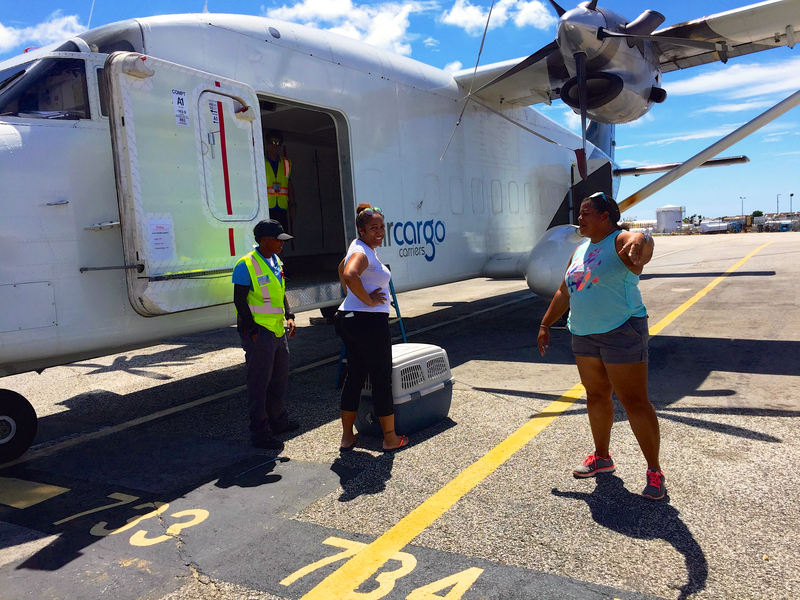 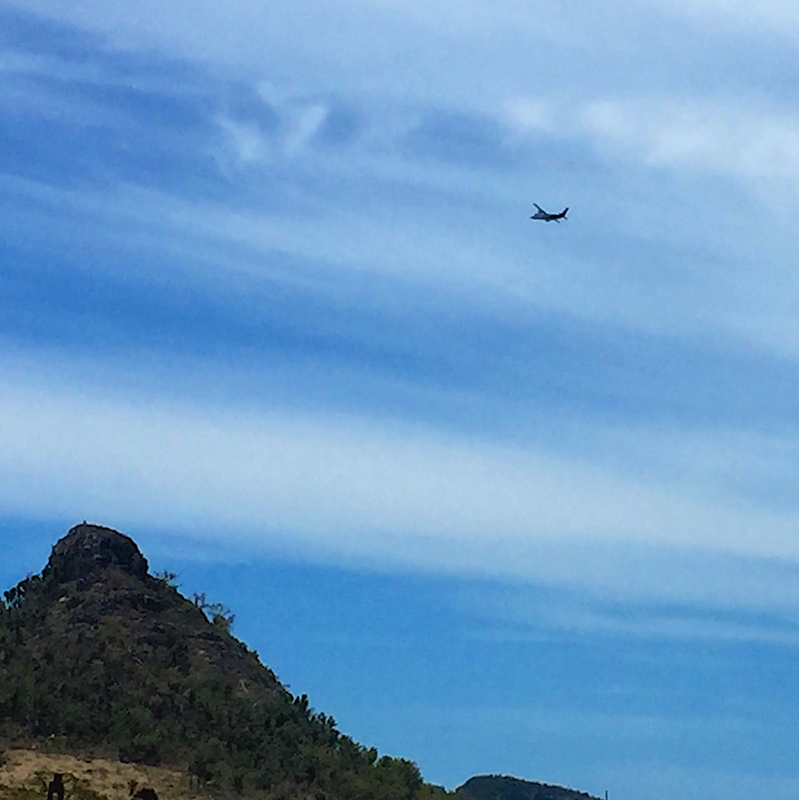 Finally, on the cargo side, Sally sat with them until they all made it through; then they were loaded by Dekha, Riselle, Vilra, and airline staff and taken to the M&N Air Cargo plane. 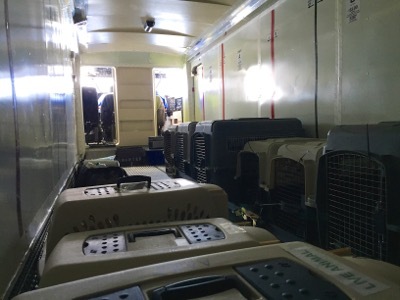 The cargo plane had two pilots, experienced at transporting animals. 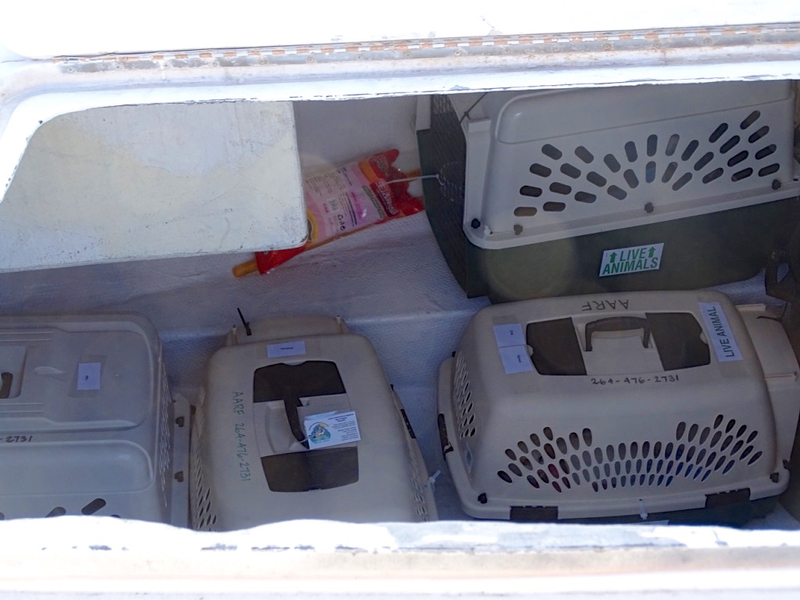 Crates were stacked along the plane sides and in the back and strapped in. It took a long time to go through security, and the plane didn’t leave until 11:40. 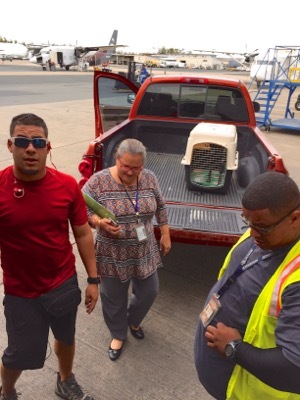 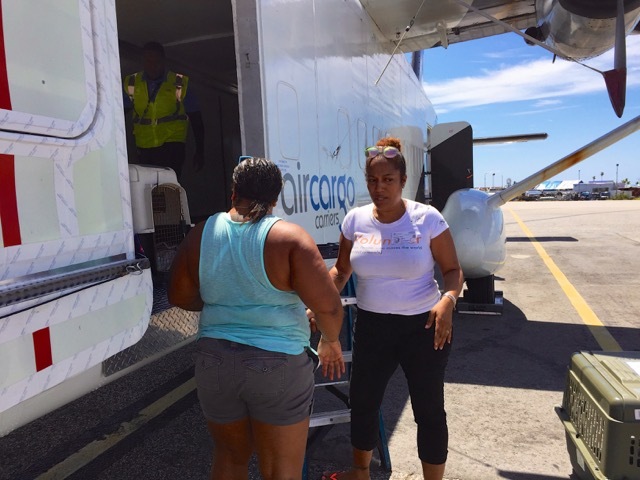 Sally, the sole person of the entire group allowed to go with the animals to San Juan, sat in the jump seat in the cockpit area until the plane was airborne, then she was able to be with the animals, talking to them and giving water. They were mostly quiet, with one dog, Bram being the most vocal. 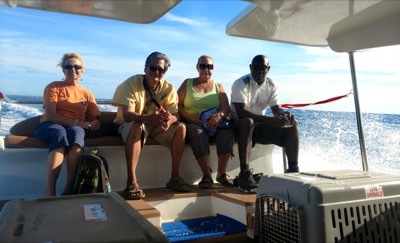 It was a smooth trip. 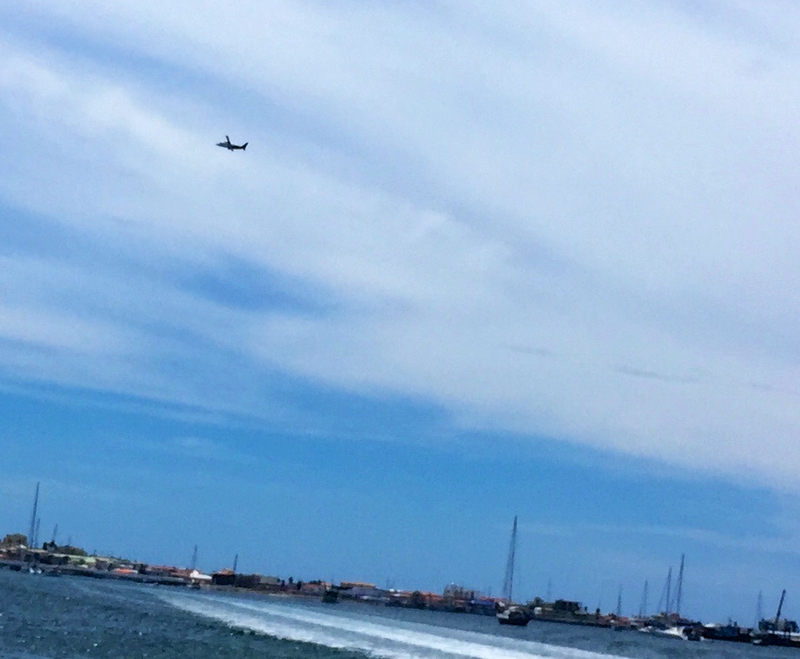 Sally headed back to the jump seat as the descent to San Juan started. 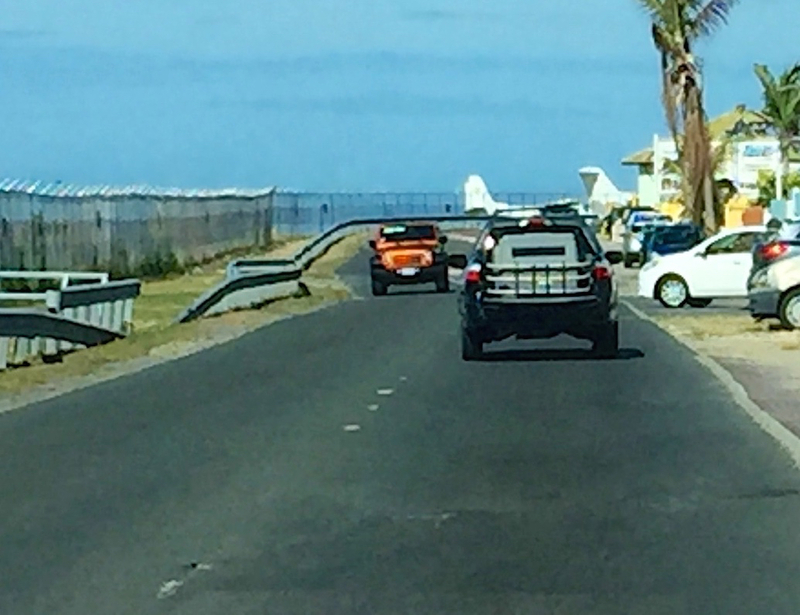 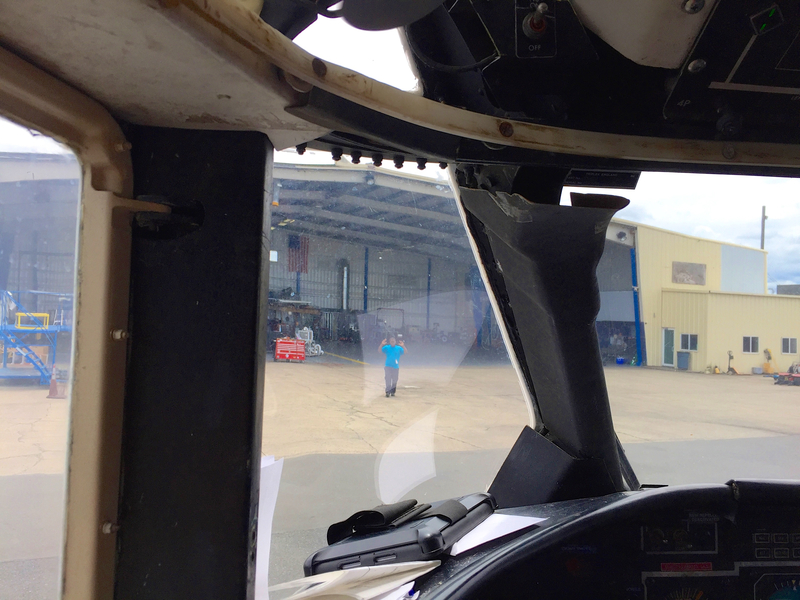 After a good landing at 12:35, the plane taxied to the charter airline area and into a hanger. The pilots actually work for Air Cargo but the flight was arranged by M&N Air Cargo. 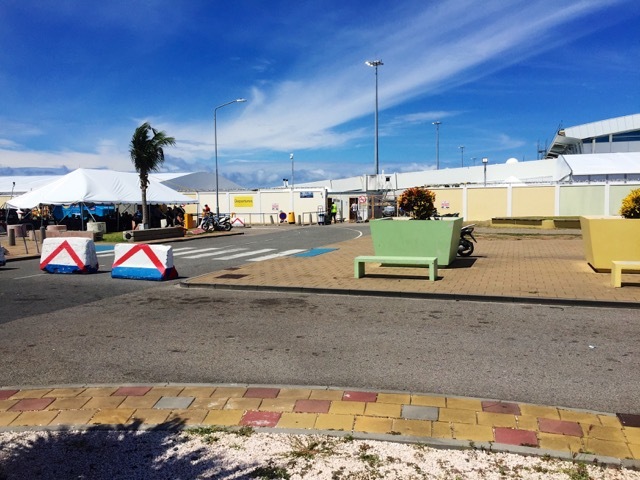 The pilots and Sally went to a special immigration/customs area. Sally was counted as a crew member since it wasn’t a passenger plane and she was there to take care of the dogs and cats. An immigration officer examined the 23 health certificates, and declared them all to be fine. He then went to the plane, went inside for a minute to look around and confirmed all was fine there. Sally went to the M&N lobby to try and find Sali Gear. Sali was, however, stuck — really stuck — in Customs. 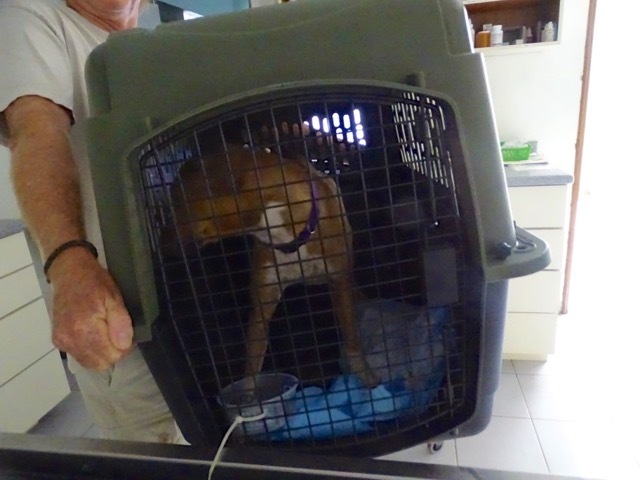 A major snag was in progress. 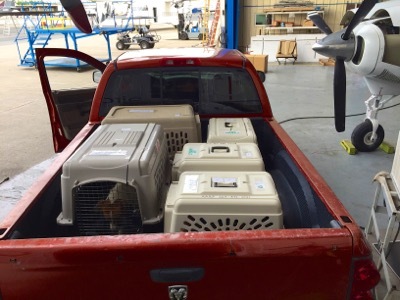 While the animals had been cleared by Immigration, the Customs officer was trying to befoul the entire process. 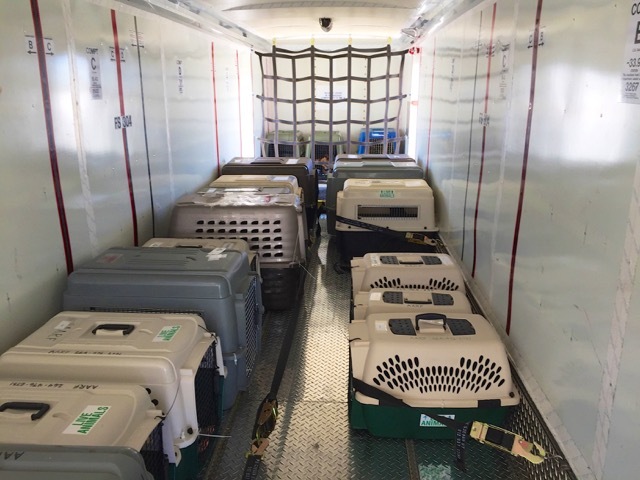 After a lot of nitpicking and not knowing how to handle the arrival of all those animals, finally the process was unblocked. 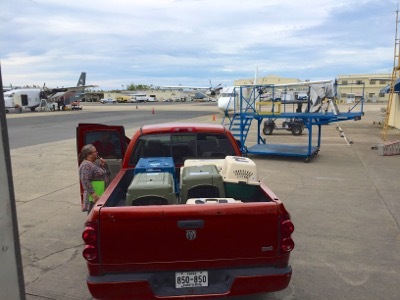 However, it was close to 5pm before anyone finally able to get the animals off the plane. Before unloading the plane for transfer to the warehouse, the crew unstrapped the crates, Sally opened them and gave water to everyone. 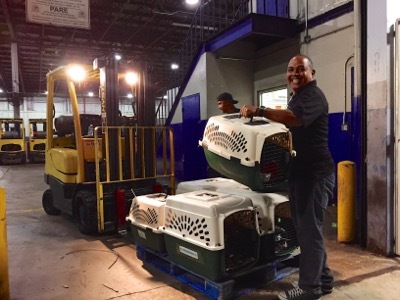 At Merriest, the animals in their crates were brought by pallet, 5 or 6 at a time. Sali, her hired driver (who was a huge help), a woman who Sali has worked with in San Juan in the past and Sally let the dogs out two at a time and walked them, also giving them water and food. 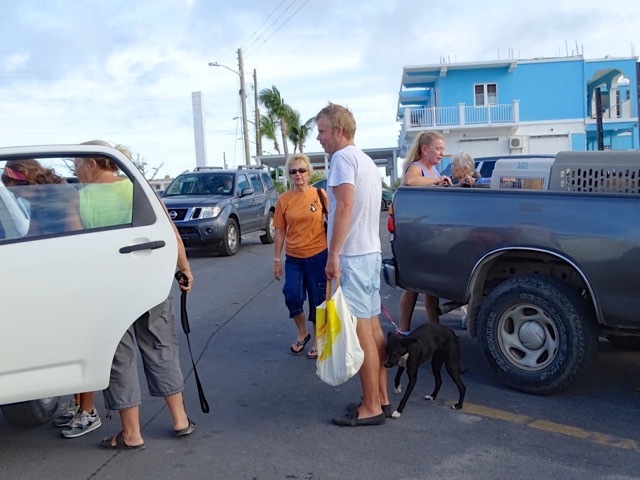 Sally had brought bags of dog and cat food, leashes, bowls, extra absorbent pads for the carriers, which was a great help. Sali also brought dog food and the driver brought fried chicken, which helped get the reluctant dogs back into their crates! 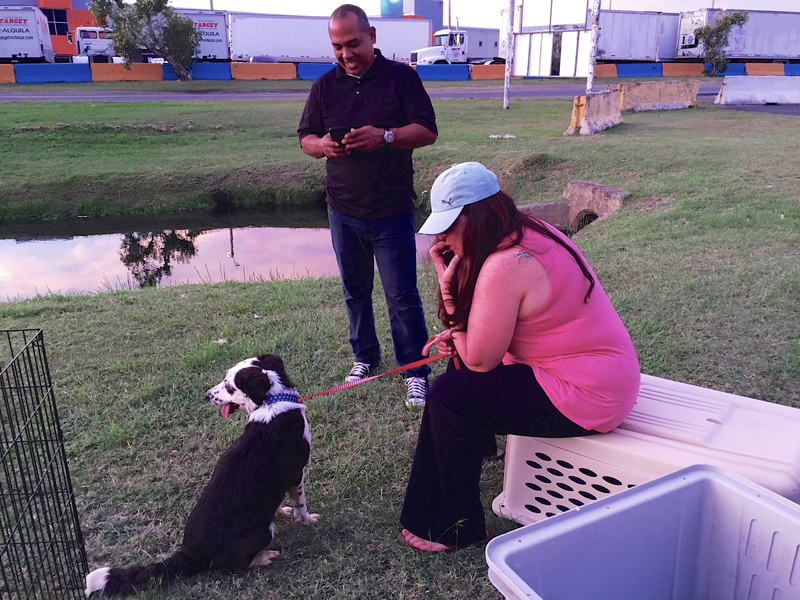 Everyone was in a parking lot outside the warehouse strip, with a big grass field. 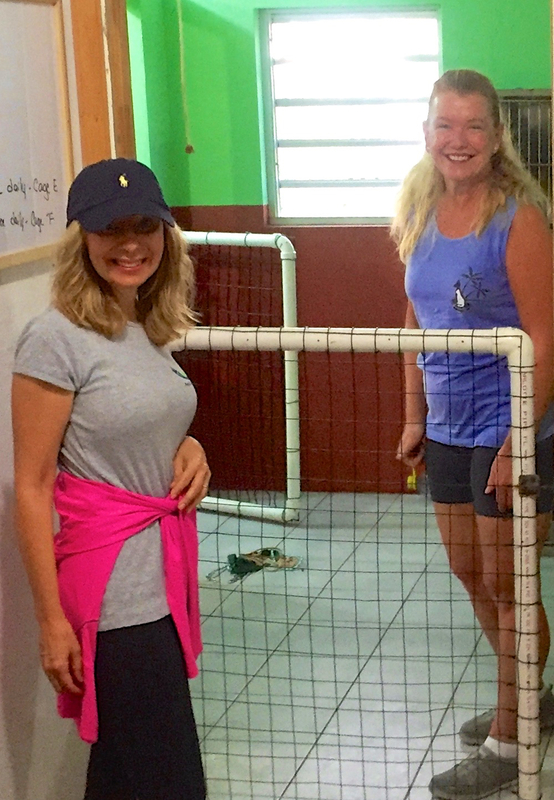 Sali and Sally did the walking, feeding and watering and the other two cleaned crates and put ripped up newspapers into them for clean bedding. 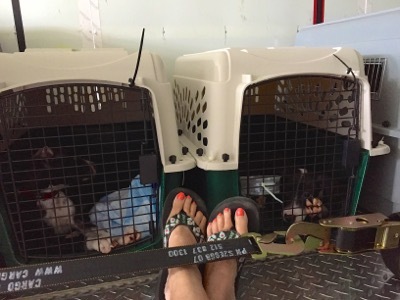 Sali had brought a portable wire pet pen, and the puppies went in it to eat and play. Once a group of dogs was done, they went back in their crates (secured with zip ties) and they went into the warehouse, and the next batch was brought out. Sally took care of the cats. One of the white ones had vomited in their water bowl, and they were traumatized. 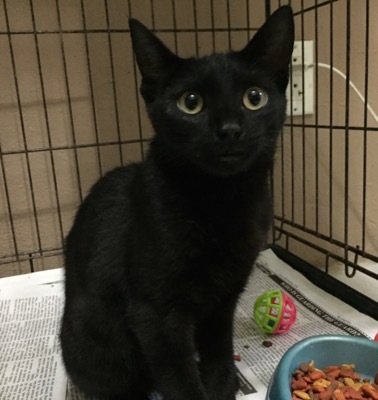 The AARF black cat, Edgar, wasn’t as frightened. 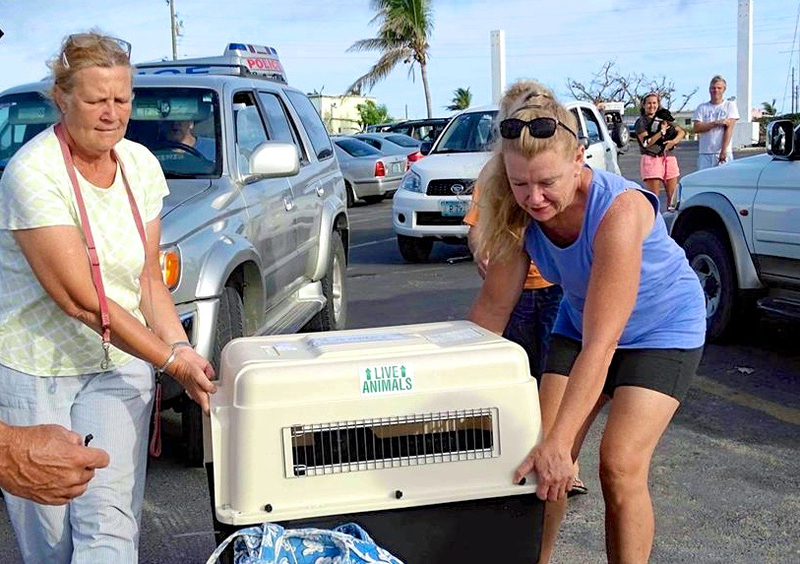 Still, it must have been a very scary day for all of the dogs and cats. Most didn’t want to go back into the crates, although Sugar, who is shy, was happy to go back in hers. 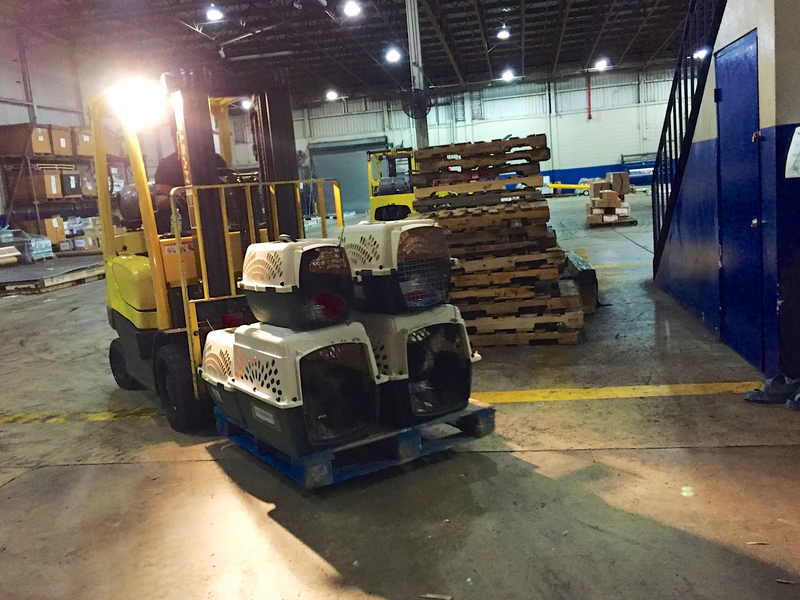 Once the dogs and cats were all back inside the warehouse and stacked on pallets, they were strapped in for the night. The warehouse was cool, with a 24 hour staff. 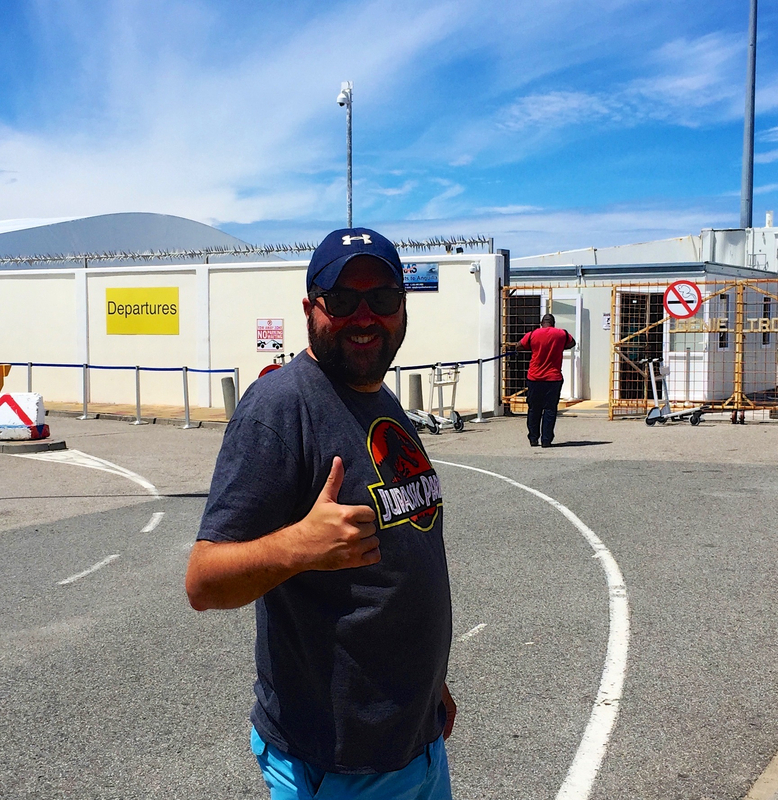 This portion of the trip was finally nearly over! 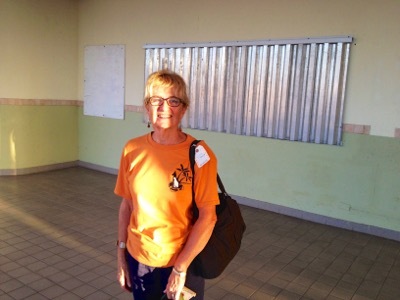 The driver/helper took Sali and Sally to the hotel where Sally was spending the night. They had dinner, then Sali left for the airport, where she had a 1:45am flight to Newark, continuing on to Virginia. The next stage was to get the animals from San Juan to the USA. 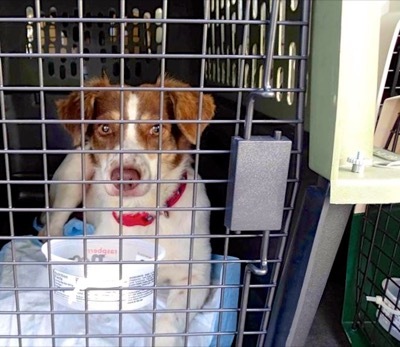 Three dogs went to a luxury boarding facility, then later flew to Washington DC. 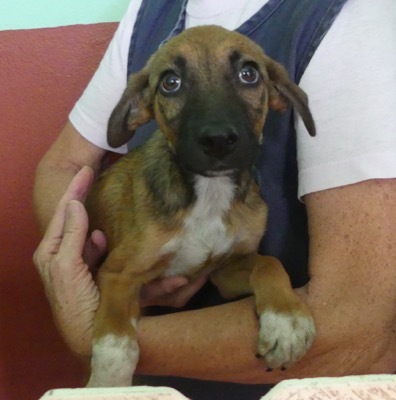 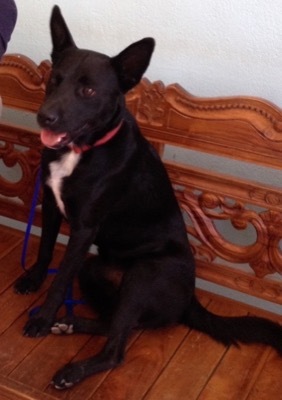 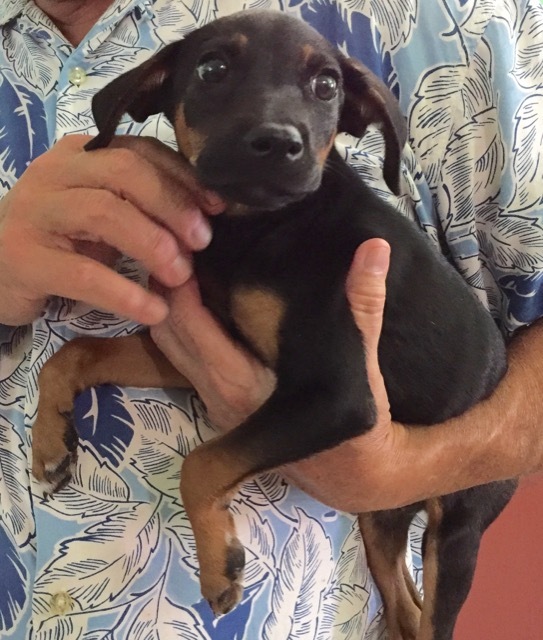 One, Bella, has a forever home in Pennsylvania with people who have a home in Anguilla. 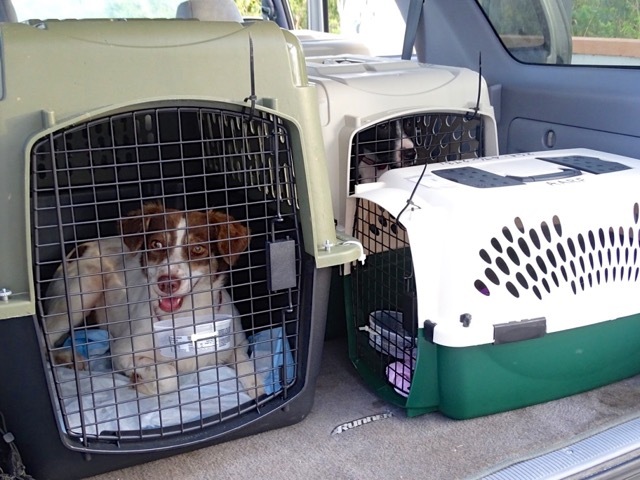 The other two will find homes courtesy of Sali Gear and her Island Dog Rescue in Virginia. 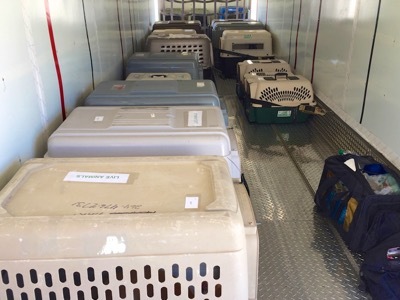 The rest of the dogs and the three cats were destined for Orlando, Florida. First, an overnight at the Amerijet warehouse, then an early morning flight to Miami, where they would be picked up by the Orlando rescue people in a large moving van. 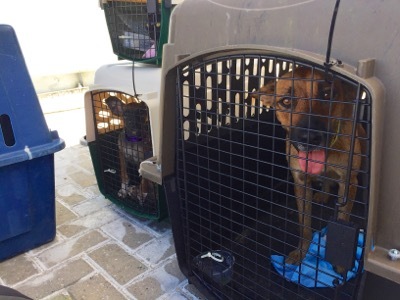 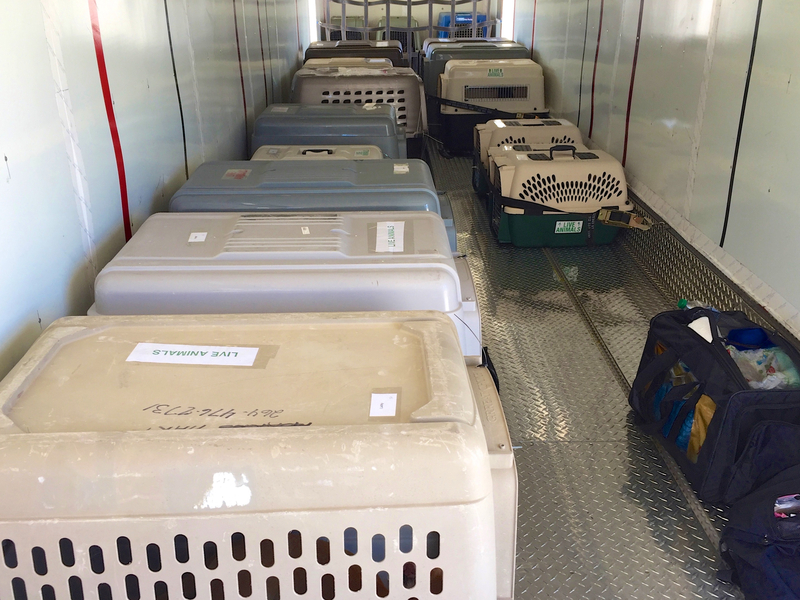 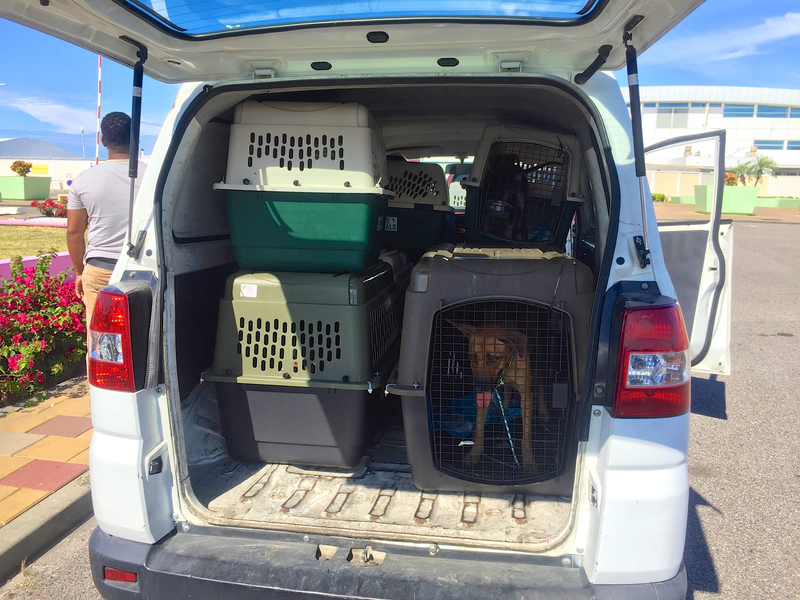 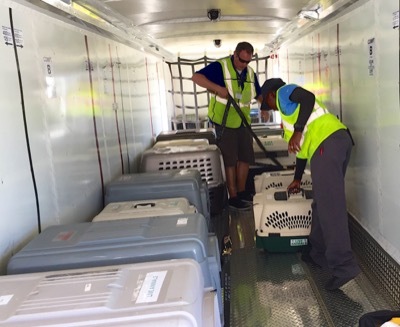 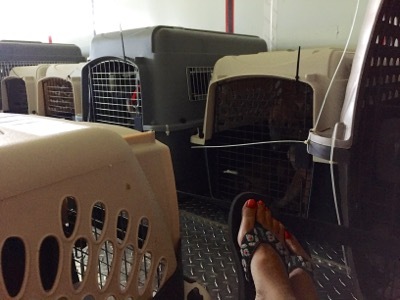 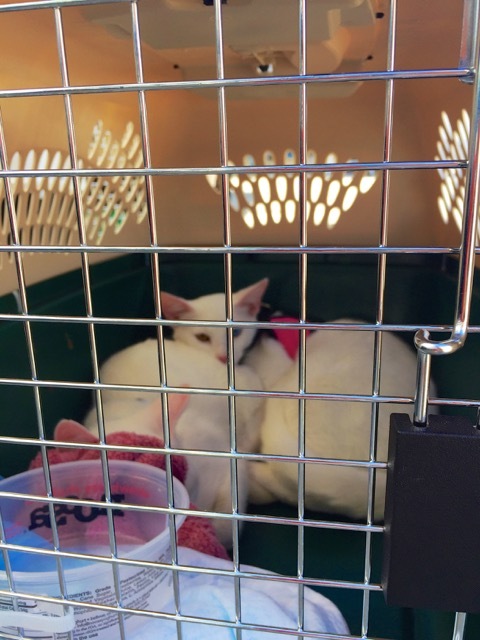 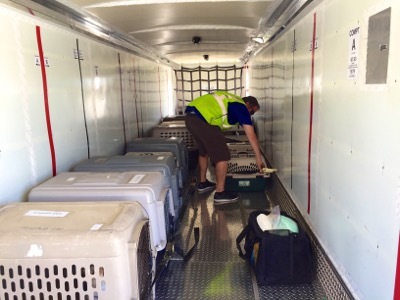 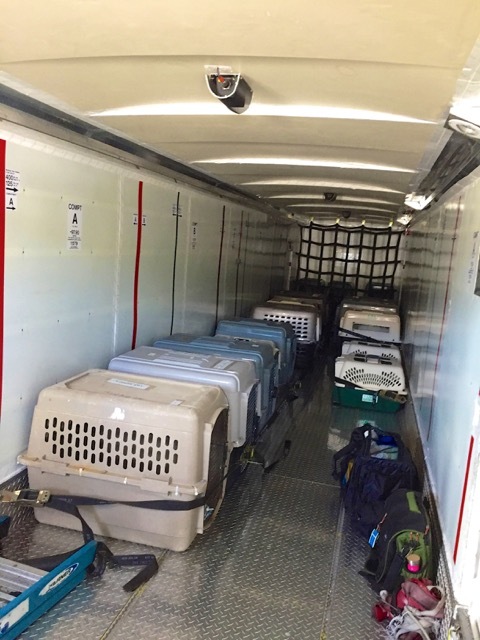 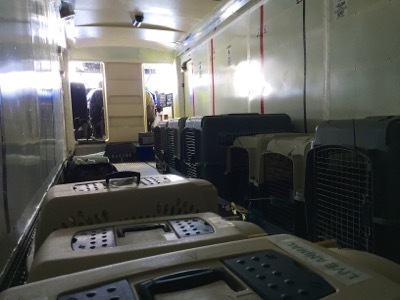 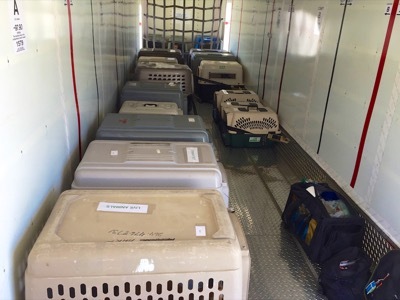 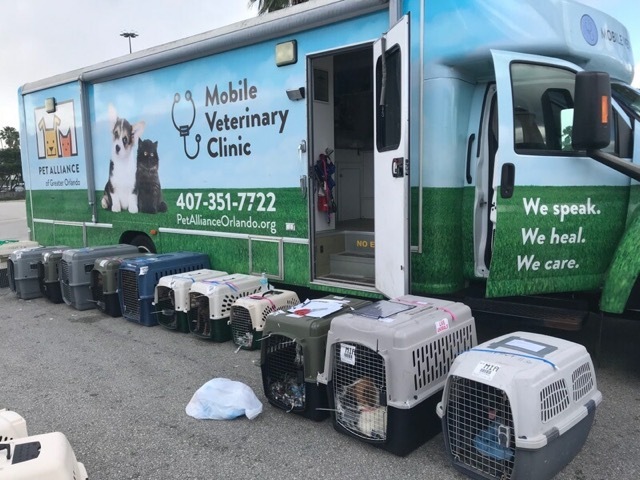 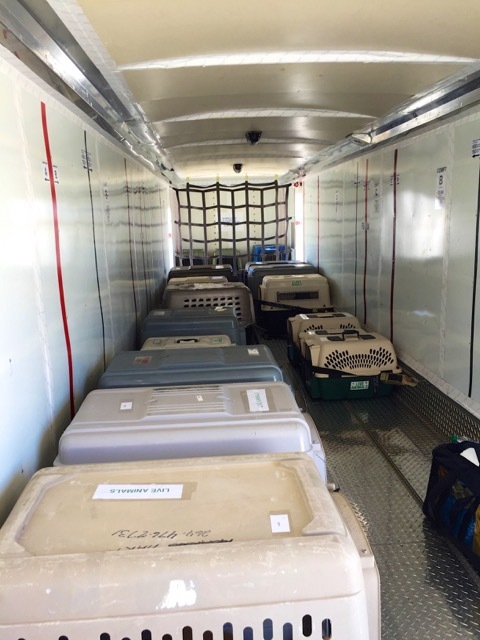 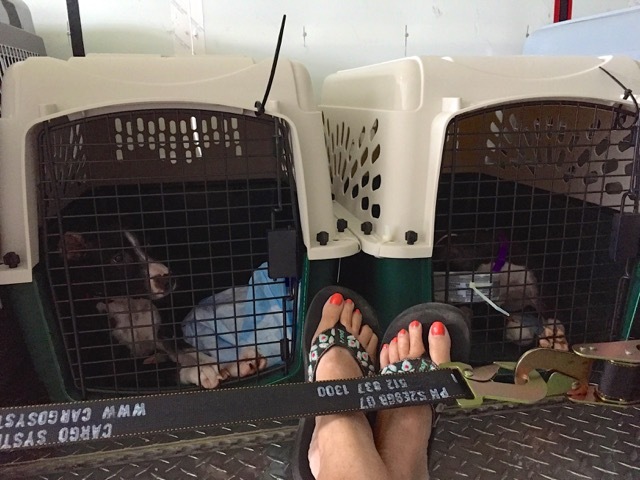 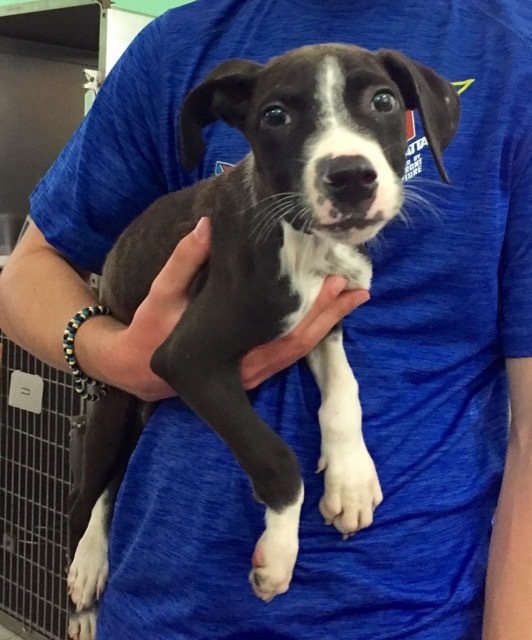 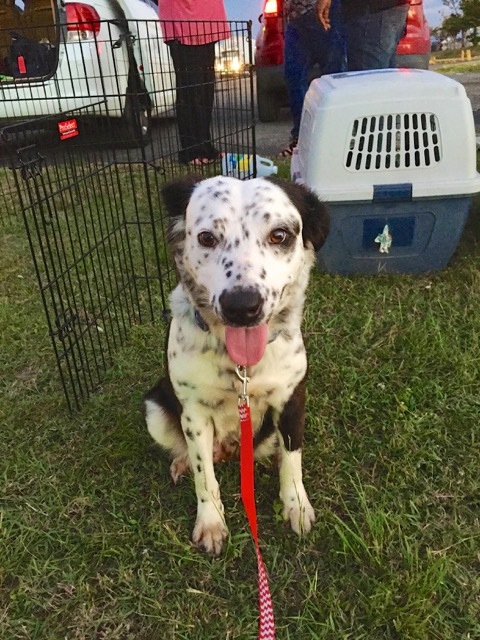 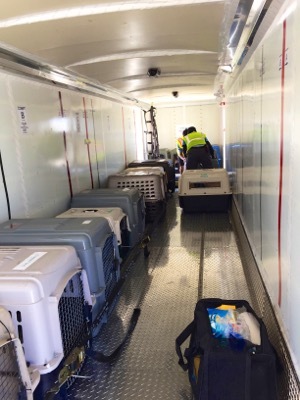 The Amerijet flight flew to Miami and the dogs and cats were picked up by the Pet Alliance Orlando group and transferred in their huge mobile vet clinic van to Orlando. 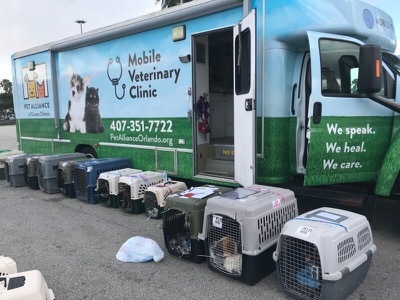 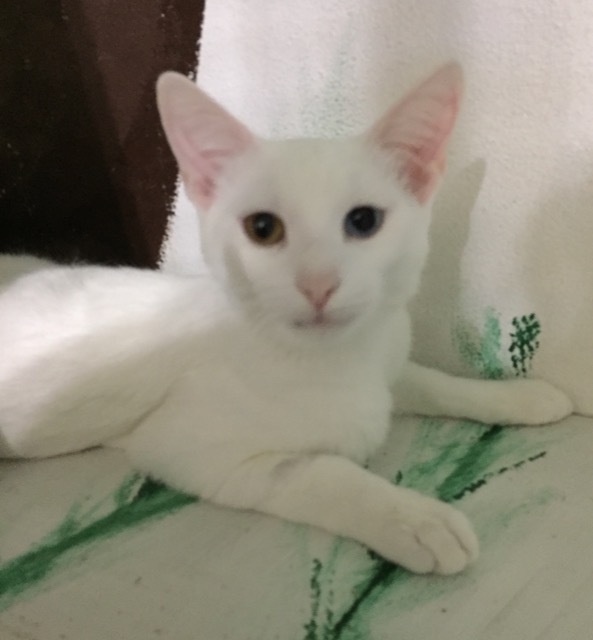 There is a vet in Orlando who was tasked checking out everyone, spaying/neutering as needed, then once cleared, they were put up for adoption. 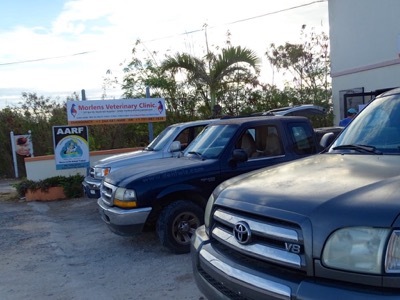 Pet Alliance was wonderful in working with all our pets to find loving homes for them. 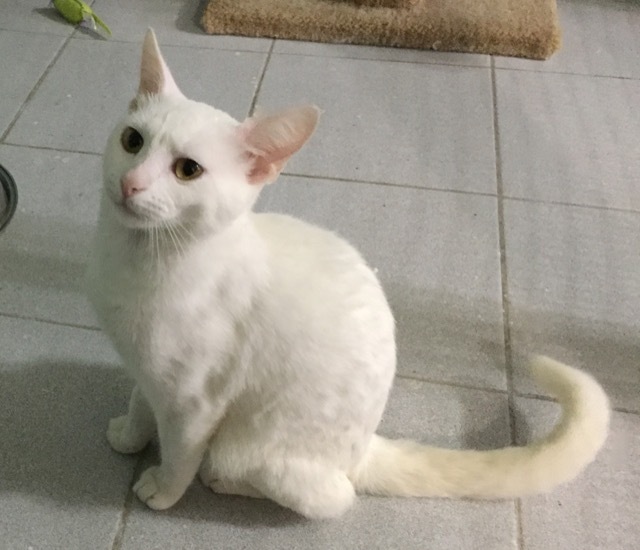 As of the next Friday morning, the three cats had been adopted and it didn’t take many days after that for the dogs to be adopted. Special thanks to the patient and accommodating Anguilla Customs and Security at Blowing Point, the Calypso ferry with their outstanding and helpful crew, Dekha and her team, Pilot Sali Gear, the wonderful staff and volunteers of Pet Alliance of Orlando, all the people people who found, helped, and fostered dogs in need, and, of course, to all of you who have donated to AARF making this journey possible. The care and concern for all the animals at our shelter is generously and professionally given by all of our amazing vets and support staff Rhaine and Ranou whose love shines through daily. 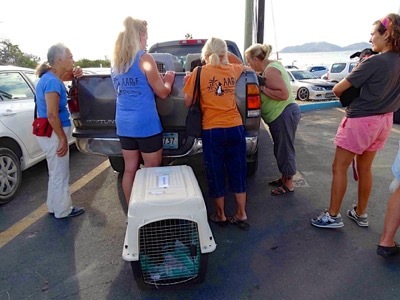 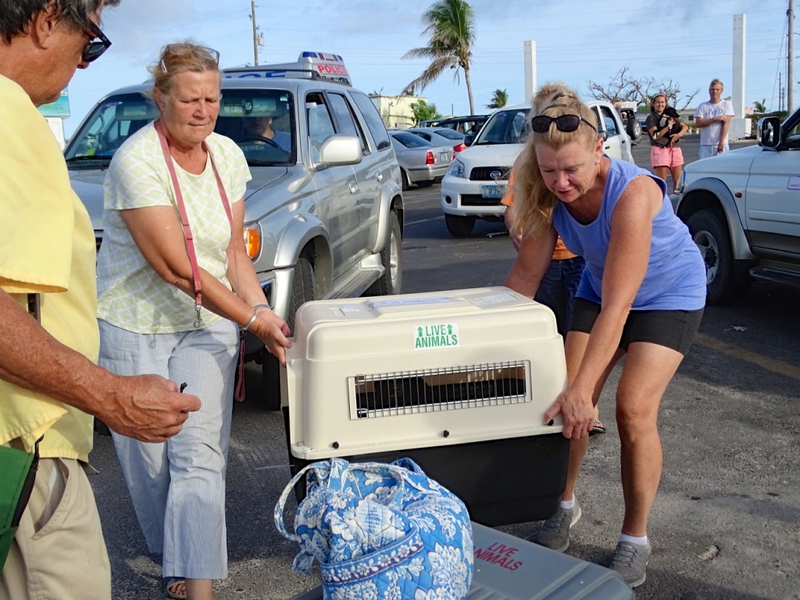 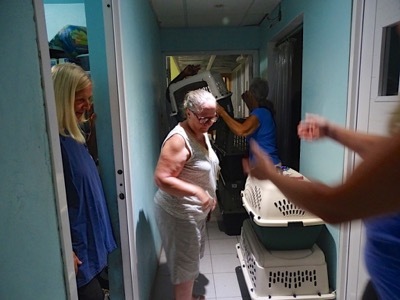 Enormous organization and planning were required so thanks to all of the volunteers, but huge gold stars to Sally Baumwell, Sali Gear of Island Dog Rescue and Renee Rempert without whom this would not have happened. Here are the photos. To see or download any image in a larger size, click on the photo. The name of the photo is given as a caption, and clicking on the caption title brings up the original, at least the one I have.